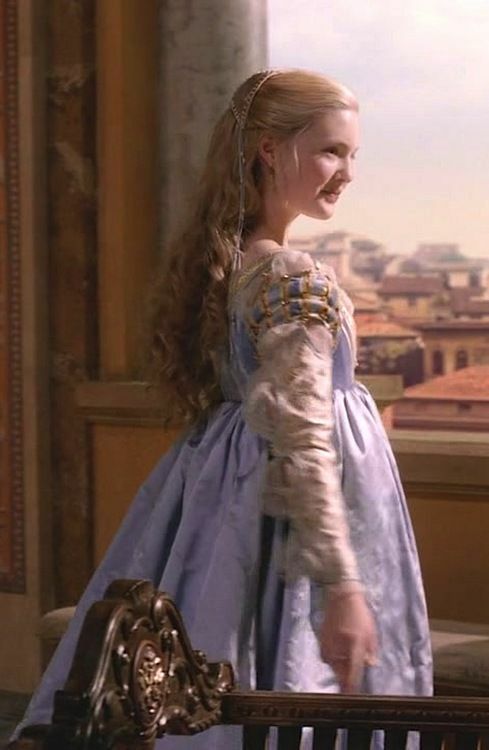 I also needed something on my head to go with my new “Borgia” dress. 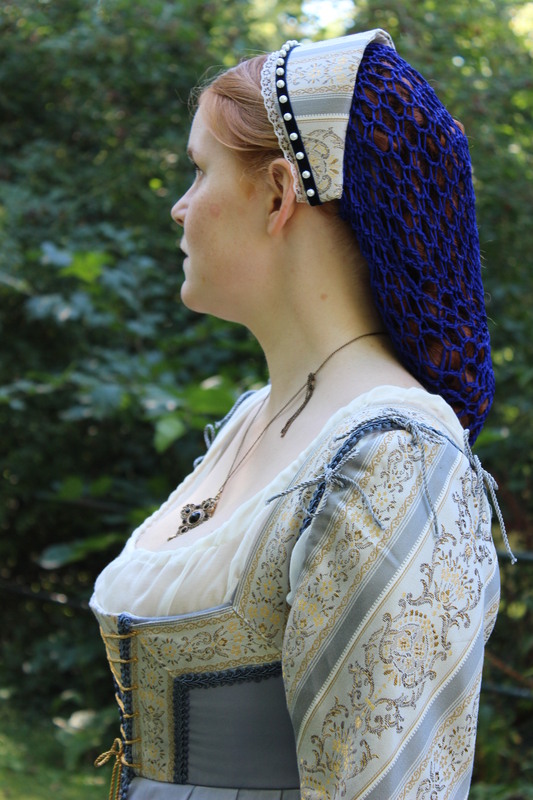 So I decided to make a simple headband (kind of a stripped down french hood) with a hair net to hide my hair, or lack thereof. 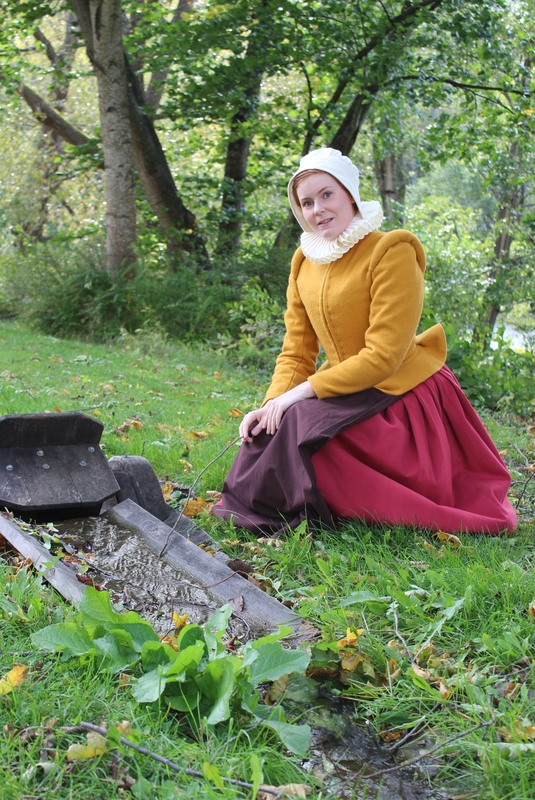 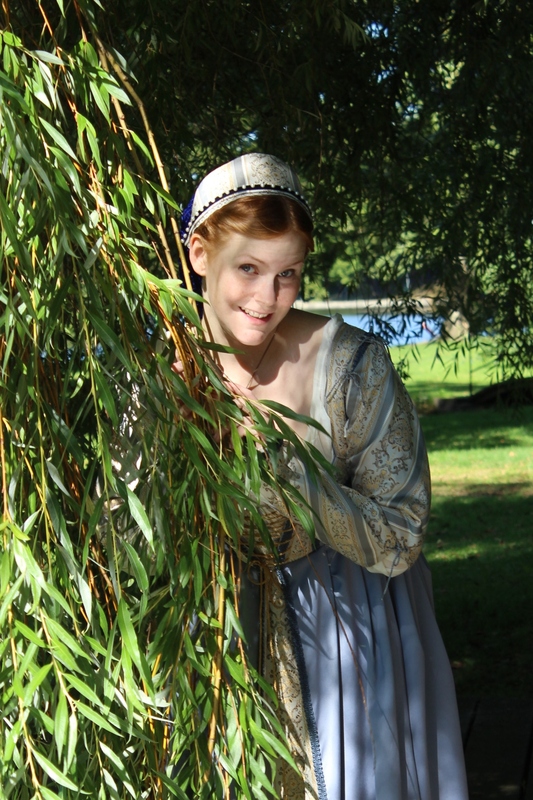 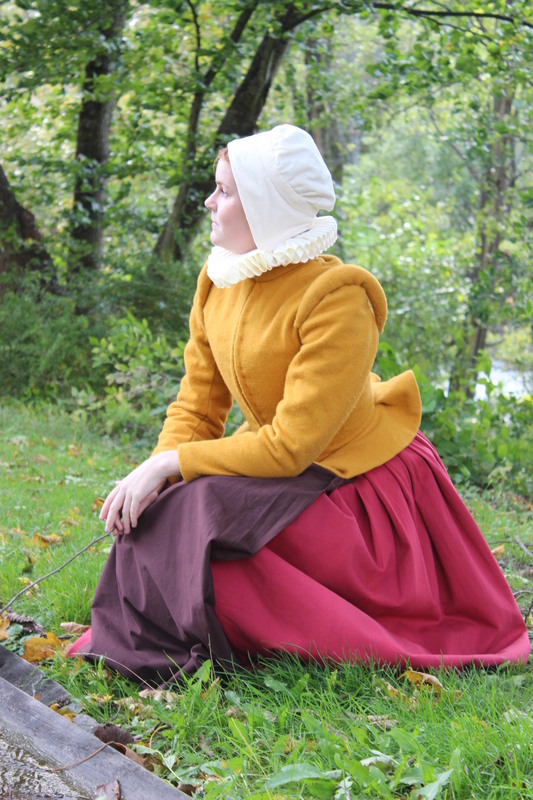 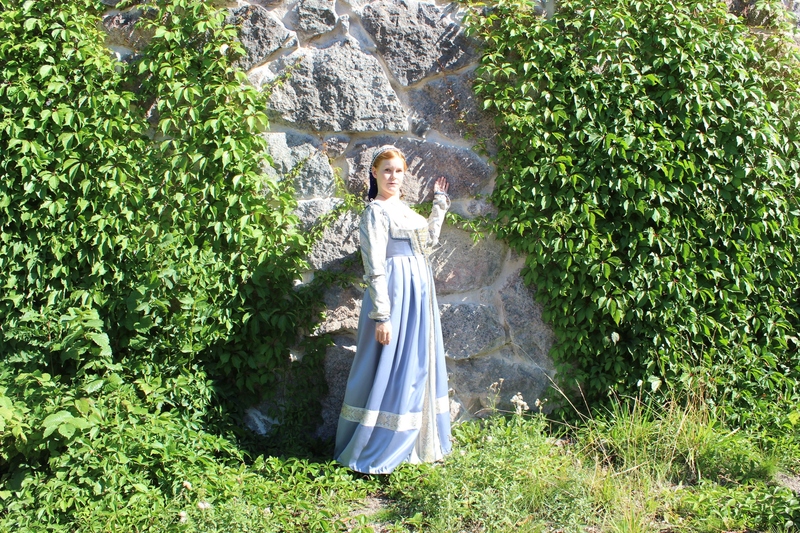 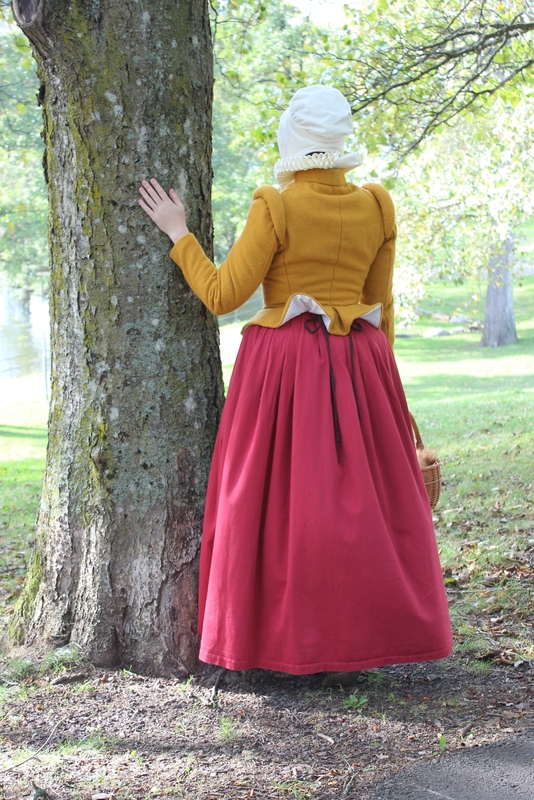 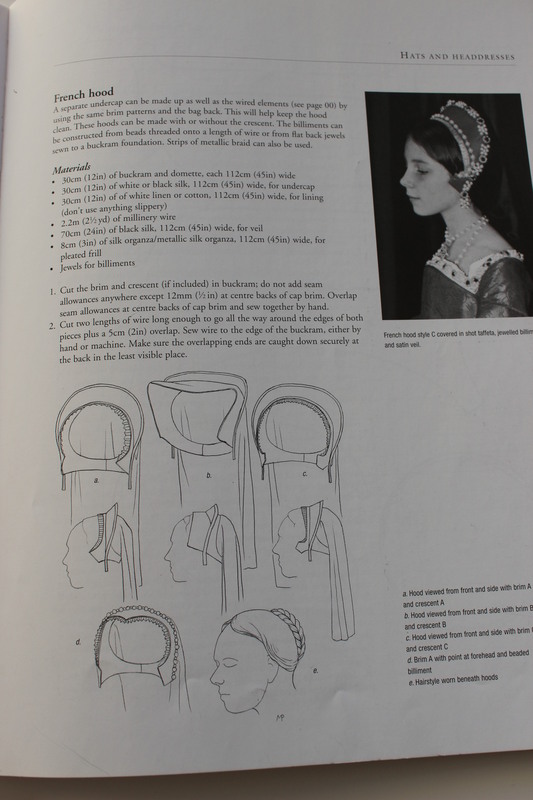 For the construction I used ” A Damsel in this Dress” great tutorial on hoods. 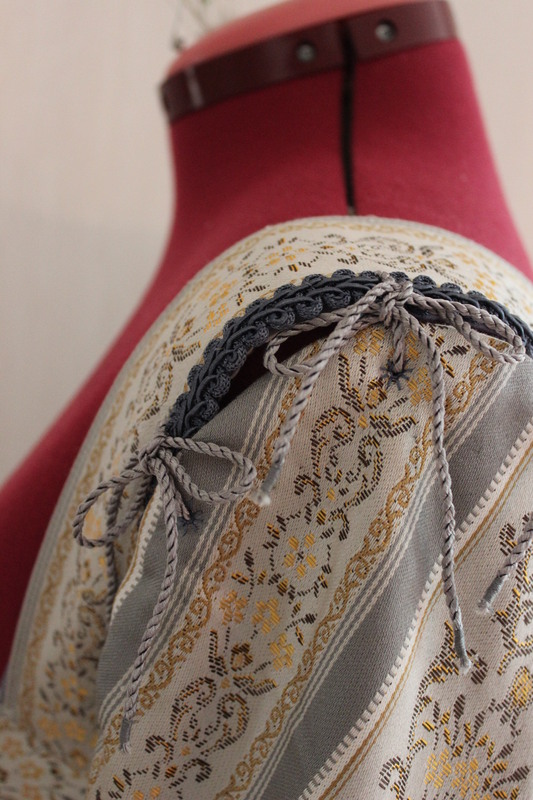 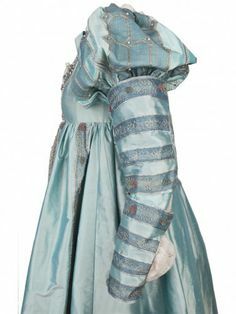 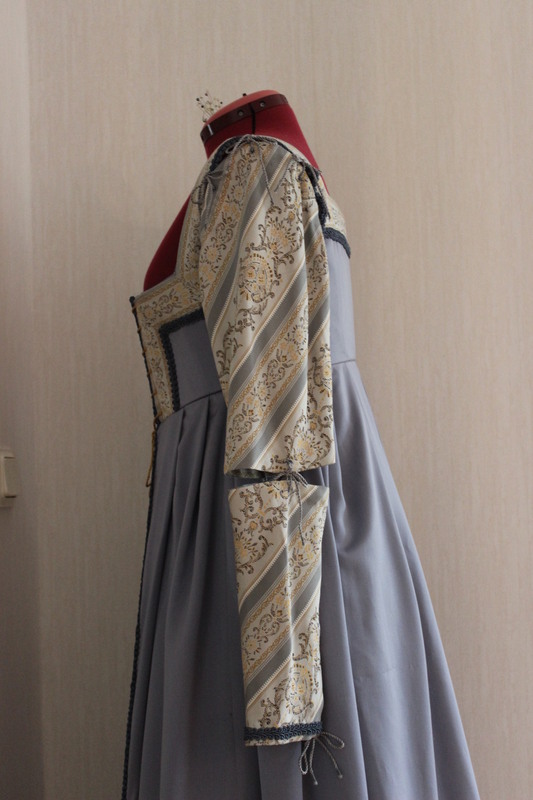 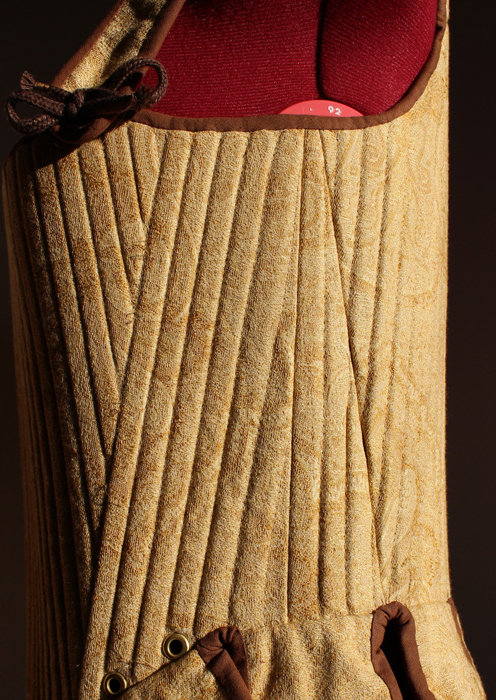 The materials I used the same striped brocade as n the dress, on top of buckram and lined with cotton scraps. 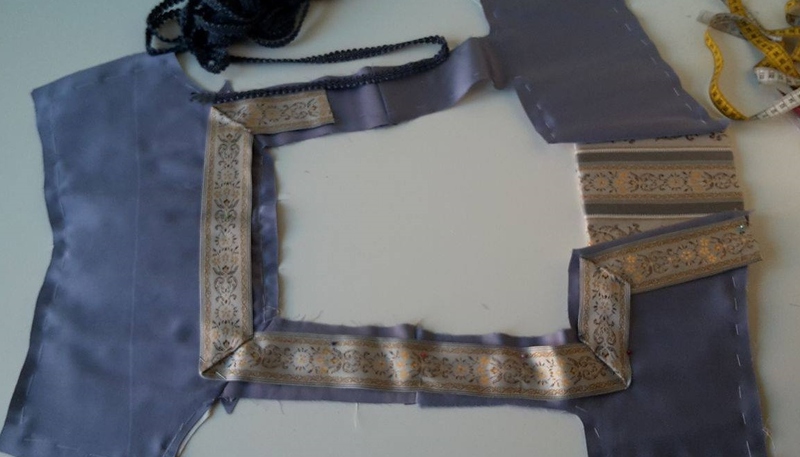 And a velvet strip to be decorated with pearls. 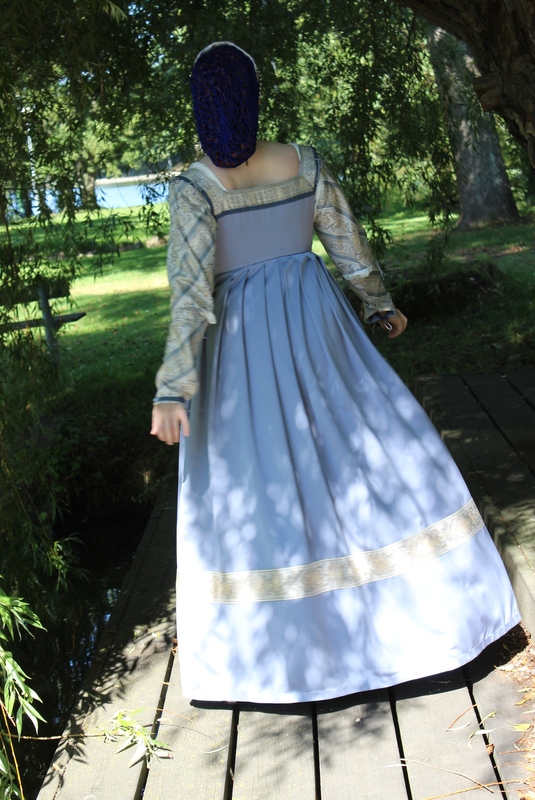 I used a bought, blue hairnet to pick up the colors from the dress. 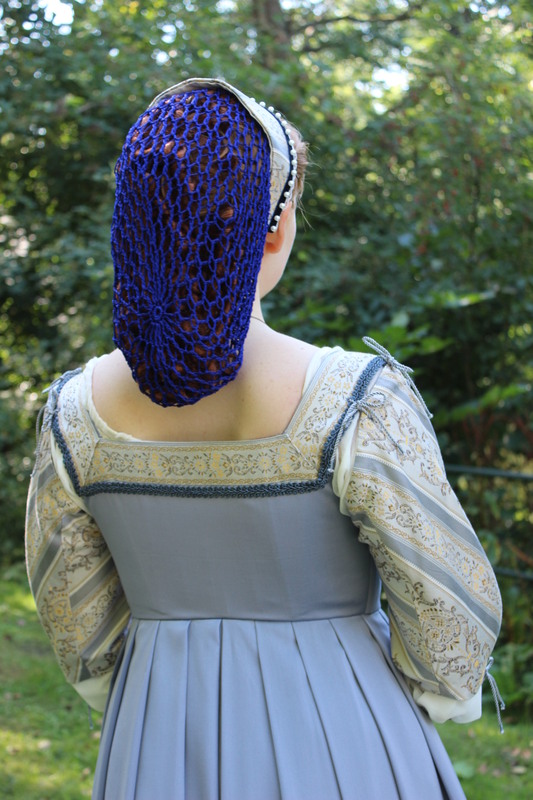 I really wanted to add beads to the hairnet as seen in paintings of the time (and in “The Borgias” series) but it didn’t work at all. 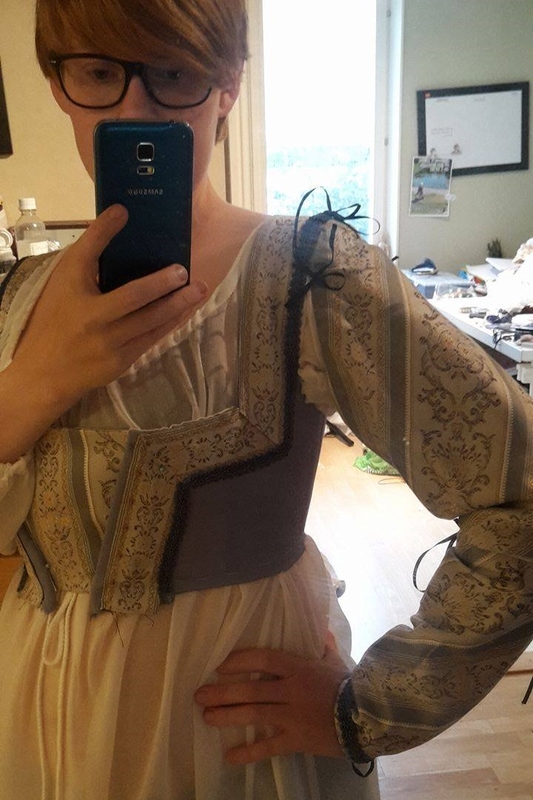 So after a few tries I decided to go on without them. 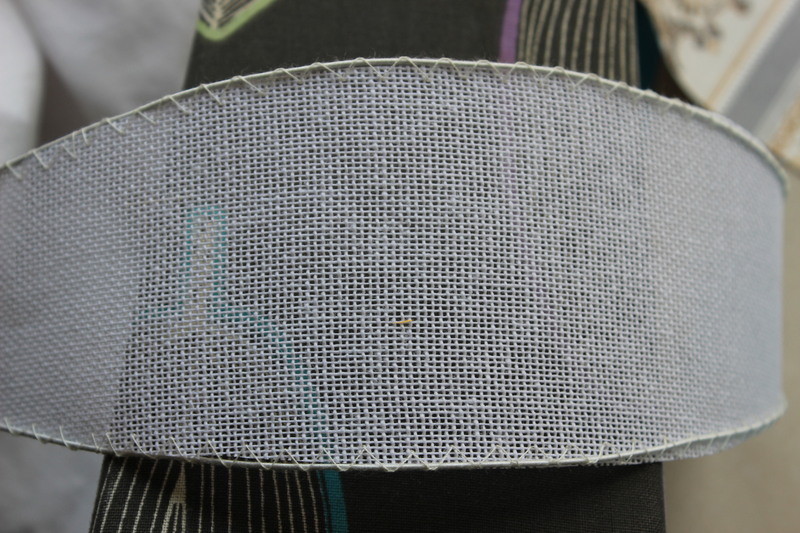 I finished the headband by stitching the hairnet to the cresent and adding wig snaps to the inside to keep it on my head. 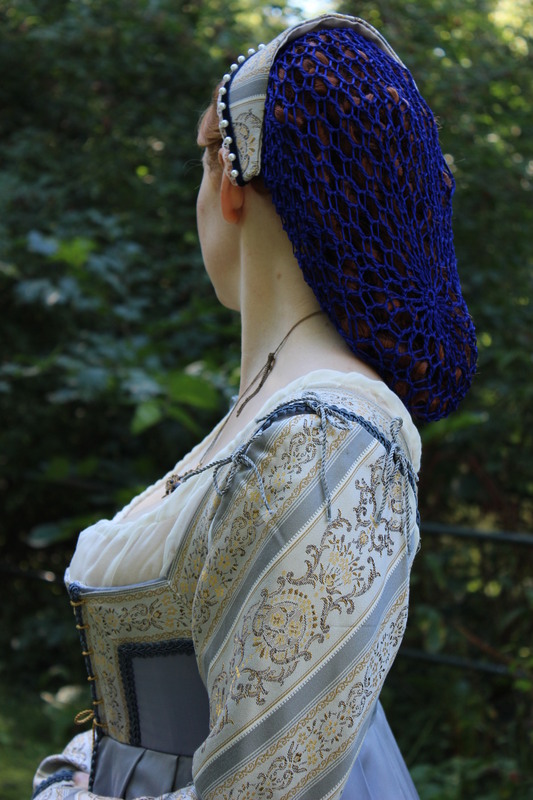 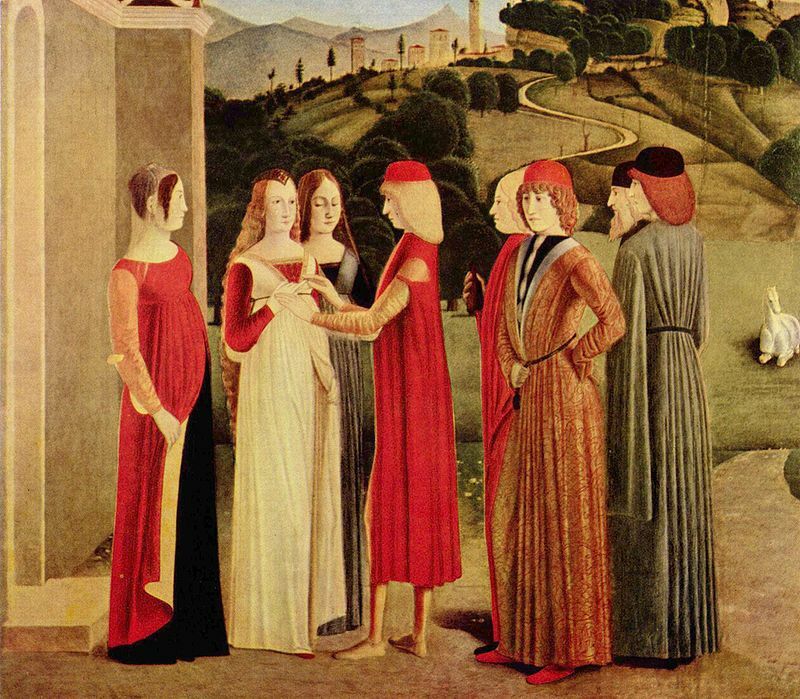 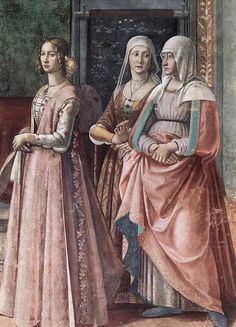 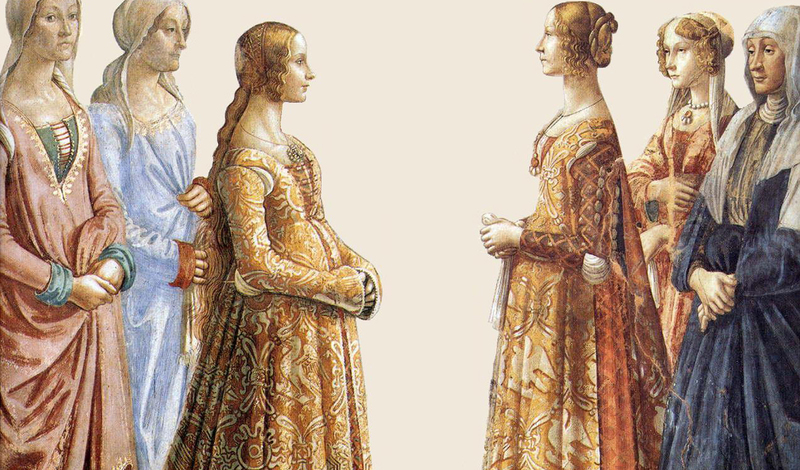 What: a 1490s Italian headwear – Cresent with hairnet. 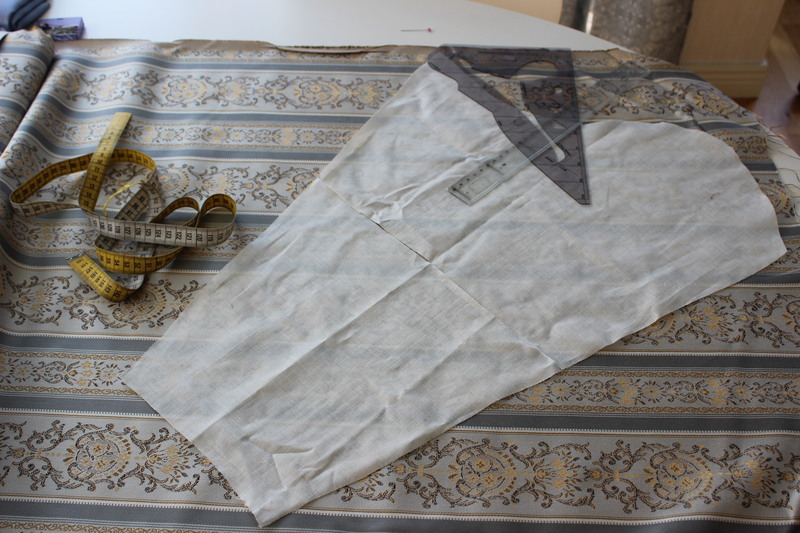 Pattern: I made my own. 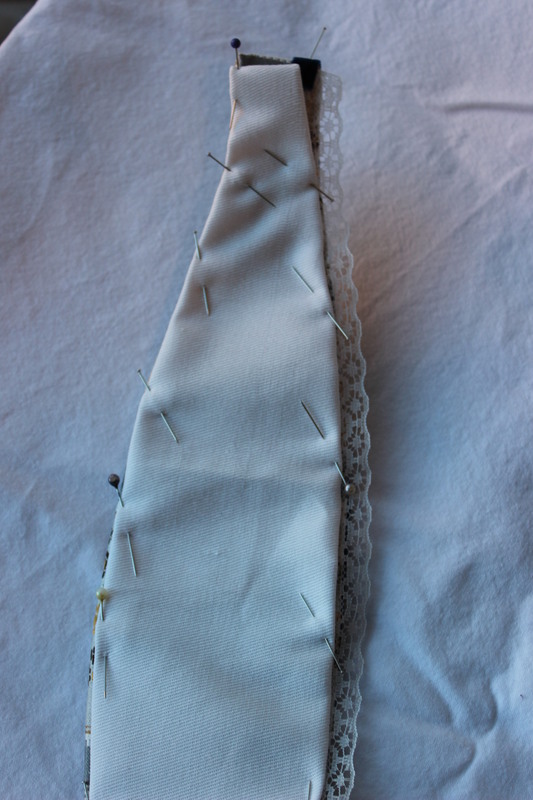 Fabric/notions: Thread, Scraps of striped brocade, cotton, buckram, lace ribbon, velvet ribbon, some pearls and about 60 cm of millinery wire. 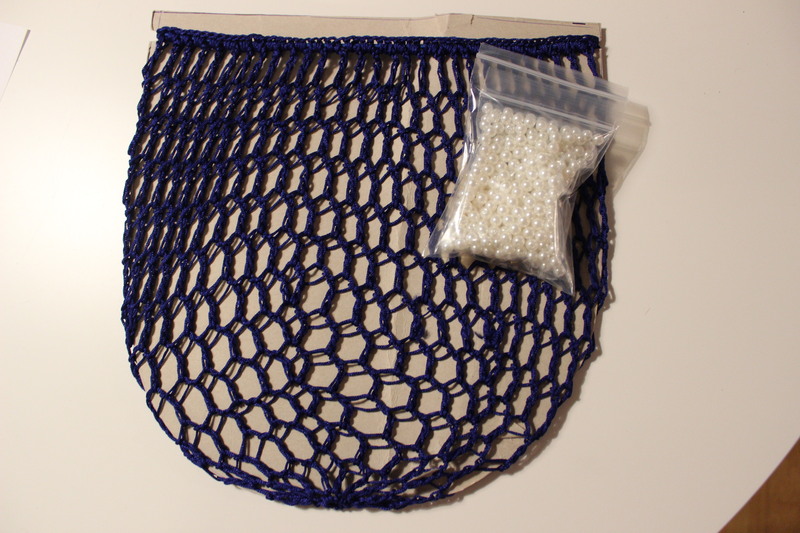 And of course a hairnet. 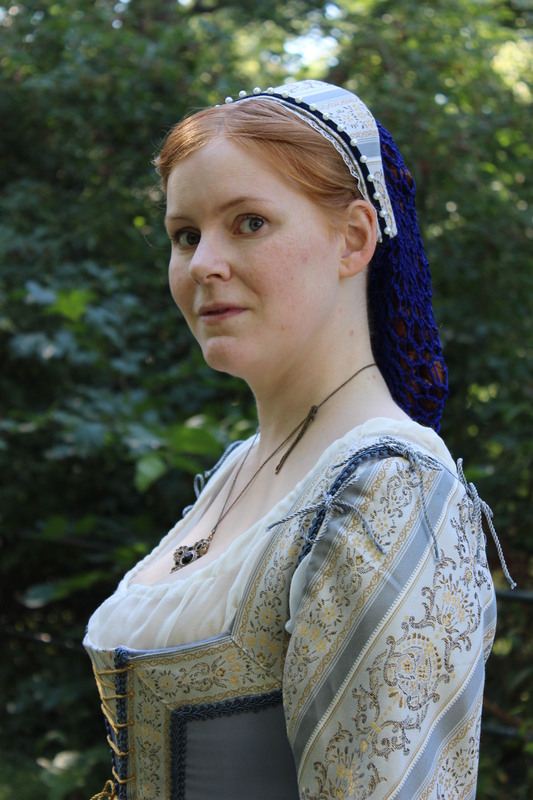 How historical accurate: Not sure., Since I didn’t really did any research for this one, but just wanted a pretty headress to go with my dress (Sorry). 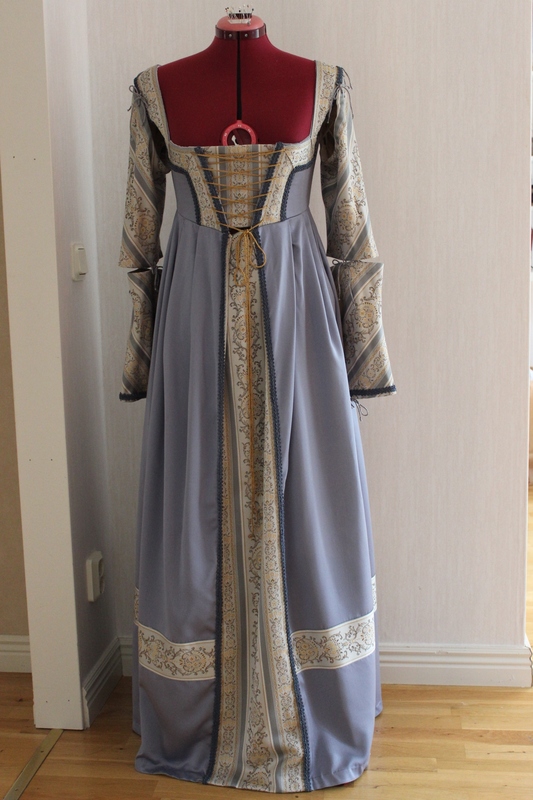 maybe 3/10. 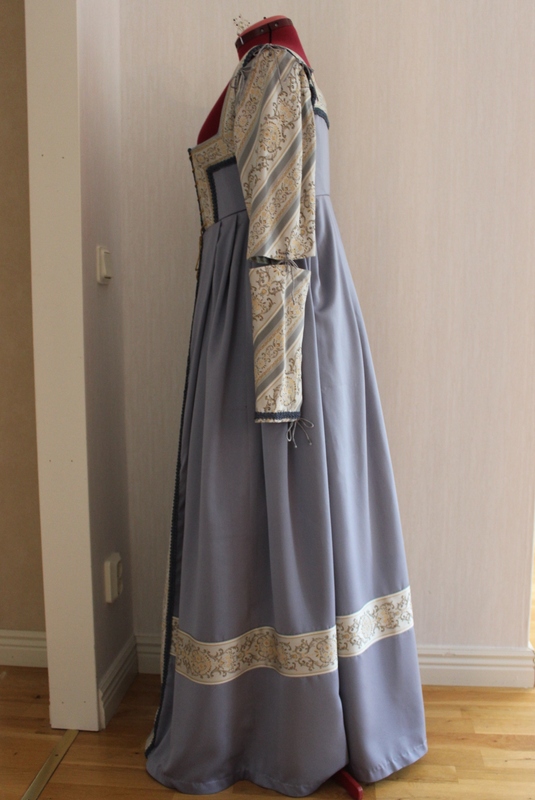 Time: Most of it are hand made, so I guestimate about 2-3 hours. 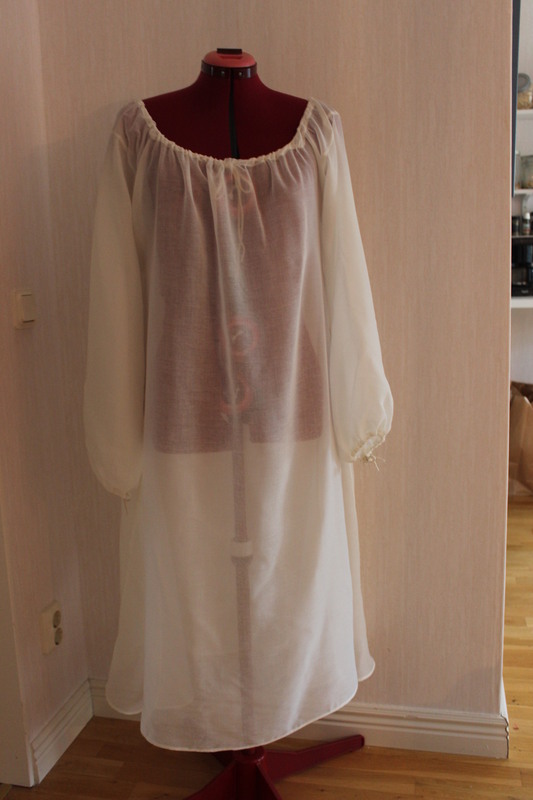 Cost: Slim to none since it all was scraps, but lets say 50 Sek (8 Usd) for everything (including the hairnet*). 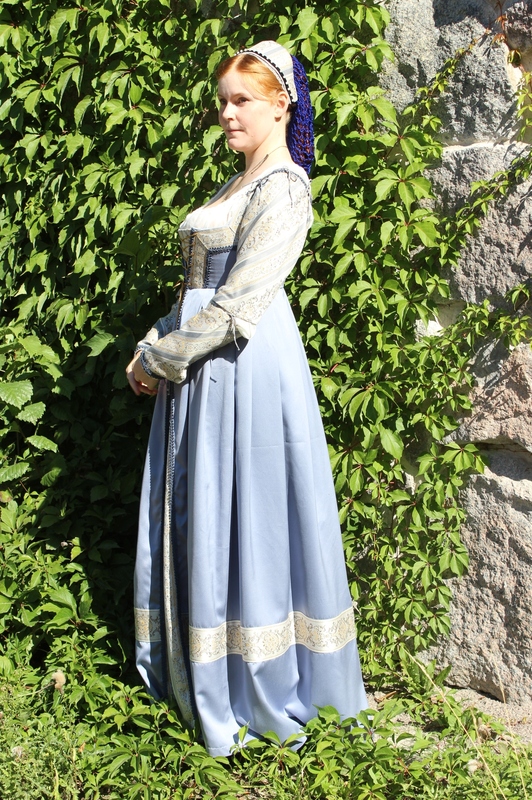 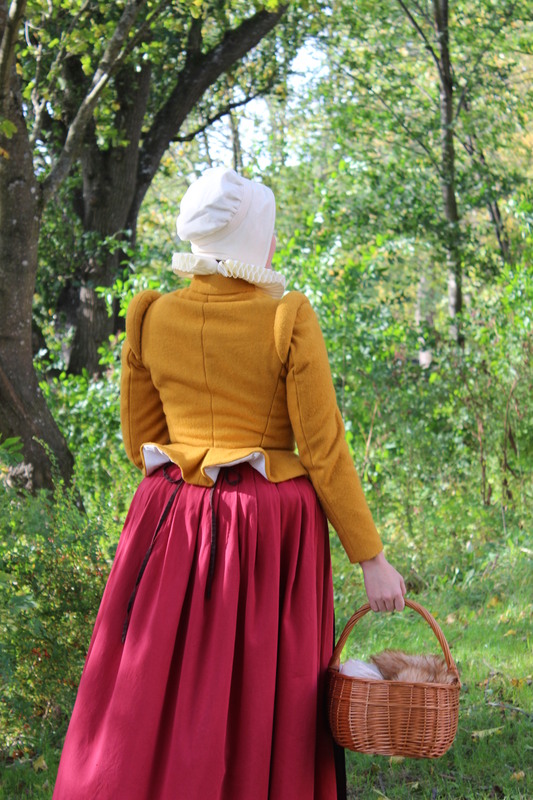 First worn: Late august for photos, and a few days later on he yearly Medieval fair. 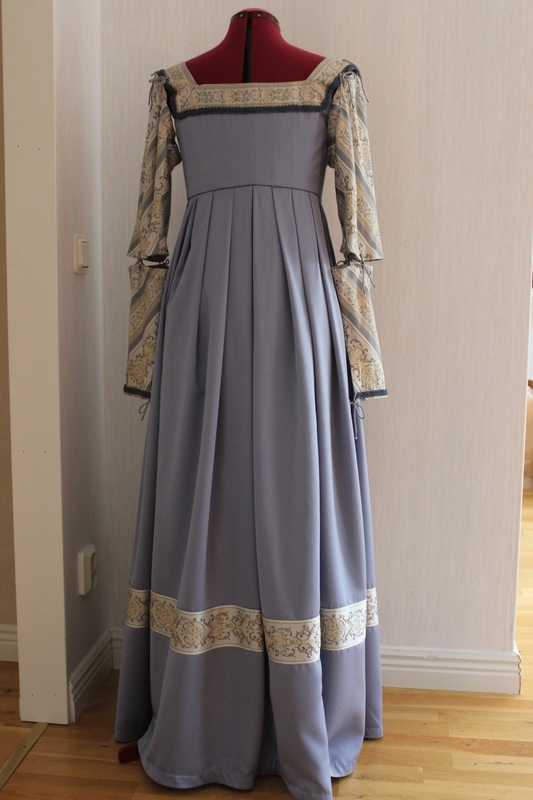 Final thoughts: I think it looks pretty and works well with the dress. 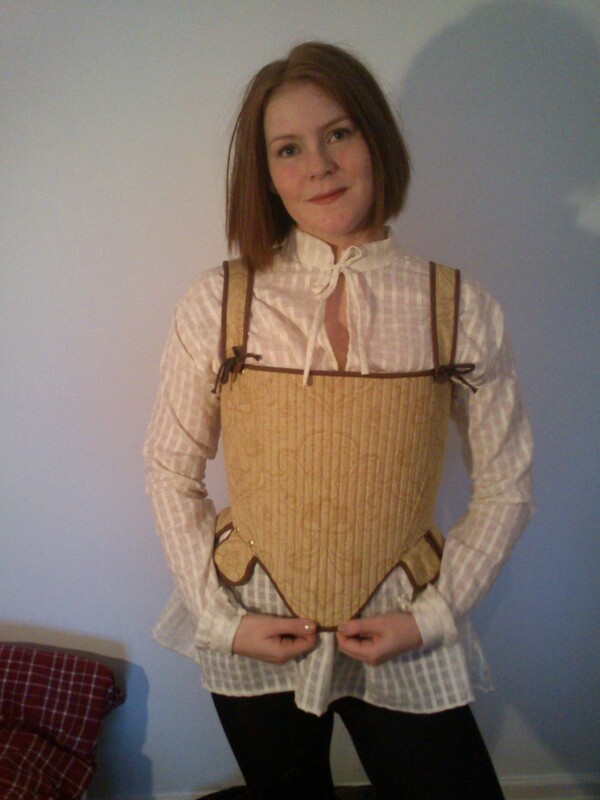 It does also do the job of (togheter with some lose hair ringlets) hiding my own short hair. 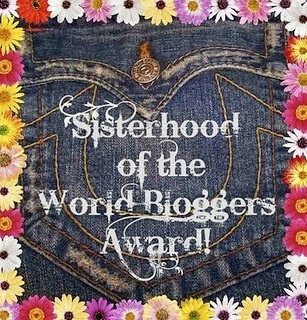 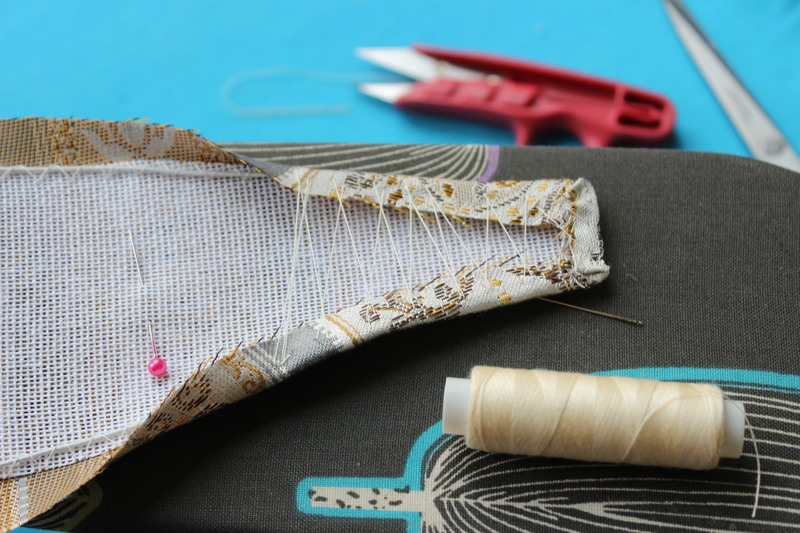 As a new mom the time for sewing is a bit more restricted then before, but when the urge to create gets to overwhelming you sometimes need to do what ever needed to get the itch satisfied. 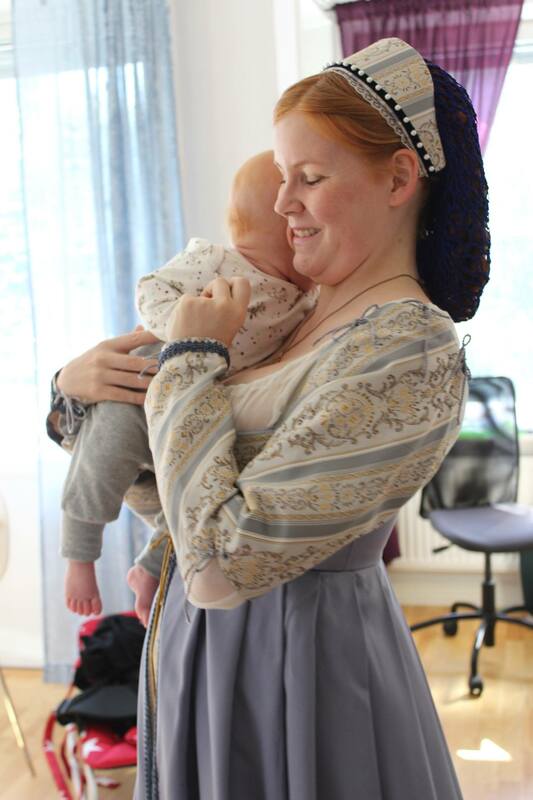 He actually falls right asleep once carried, whether I’m handsewing or using the machine. 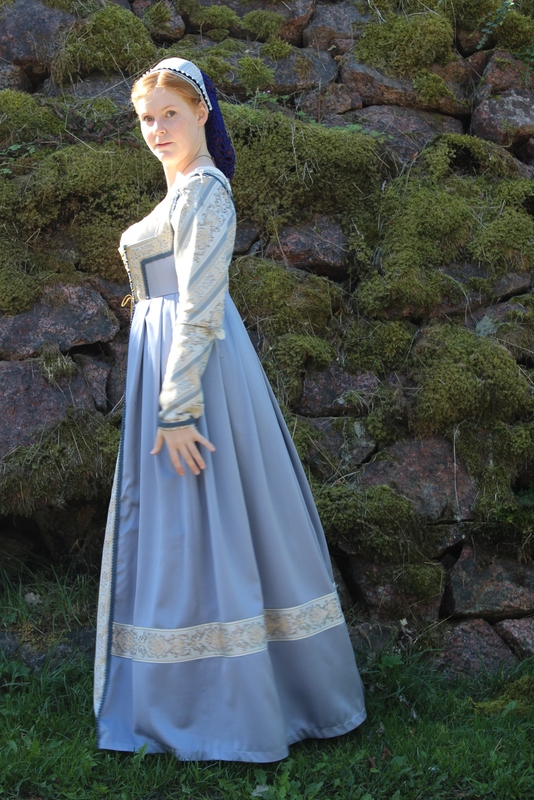 Starting where we left of, finished the skirt, sleeves and assembled the bodice I hated the dress. 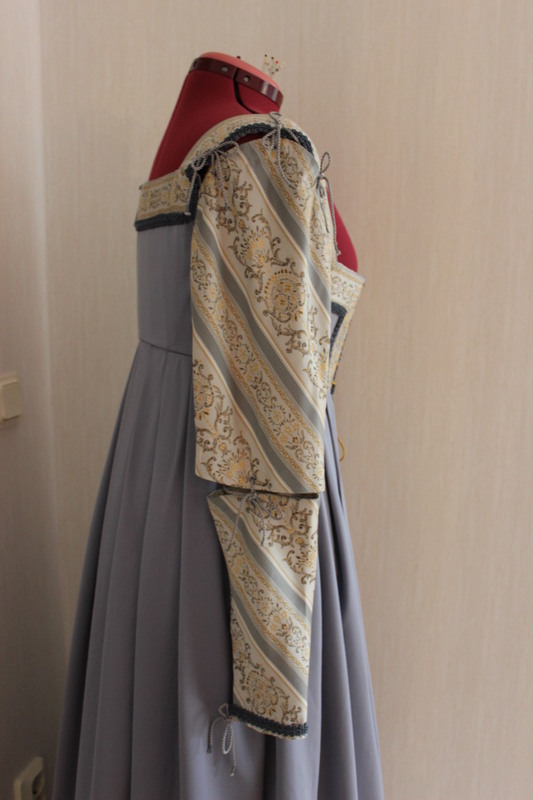 I was so frustrated I left it on the dressform several days before I got the energy to tackle it again. 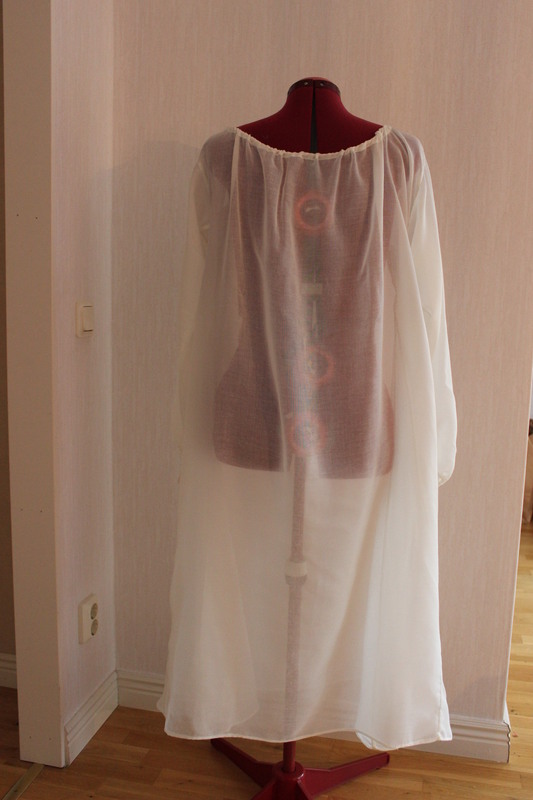 By then I’ve convinced myself that once finished it would look much better then limp and sad on my dressform. 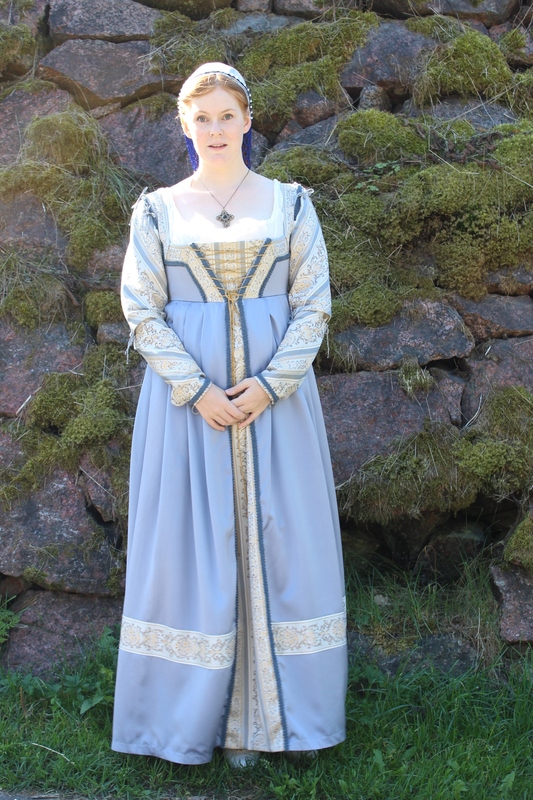 I also hoped the proportions would look much better on me then on the form. 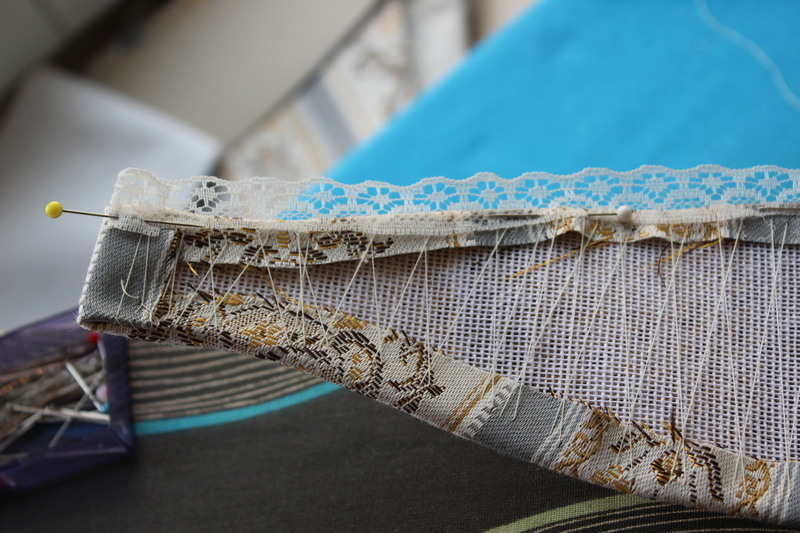 So carry on I did, marking the lacing holes. 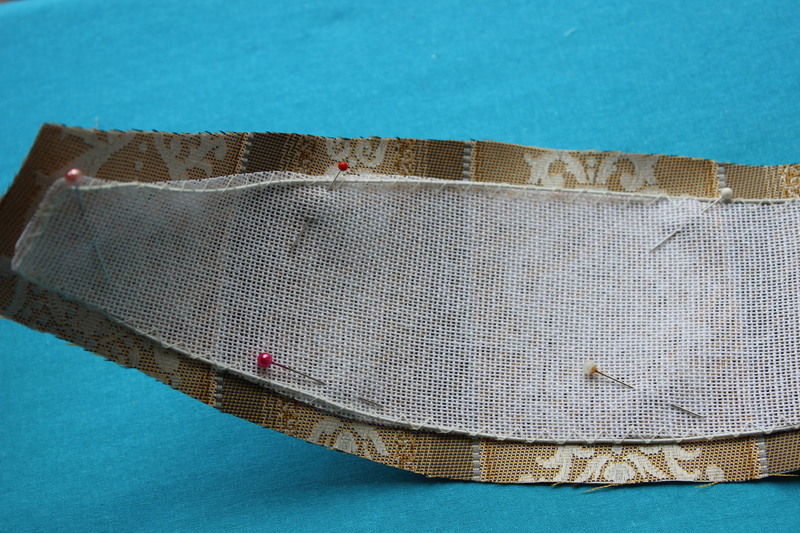 Right side finished with lacing holes and trim. 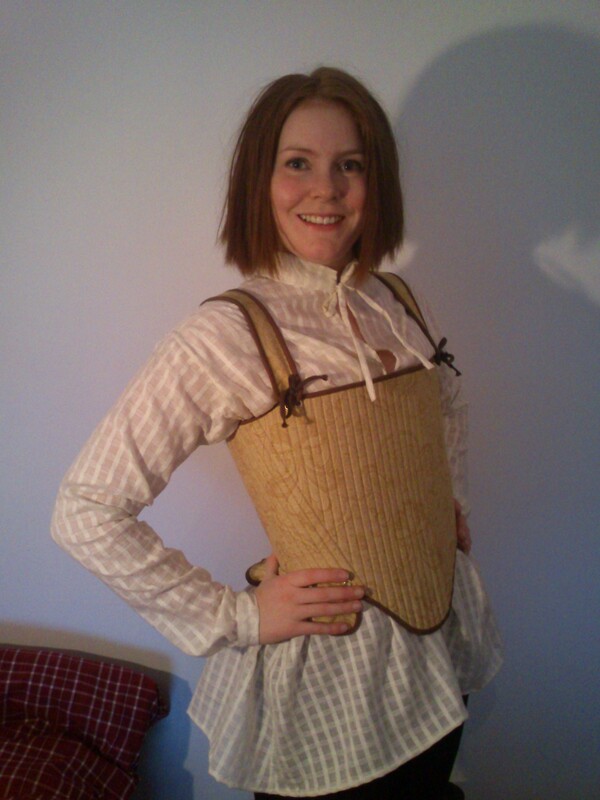 The fit is almost perfect (if you ignore the ridiculous low neckline). 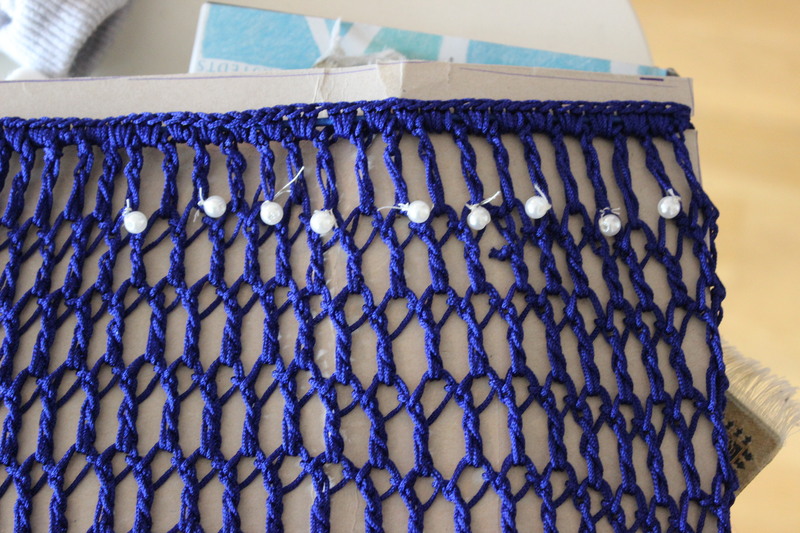 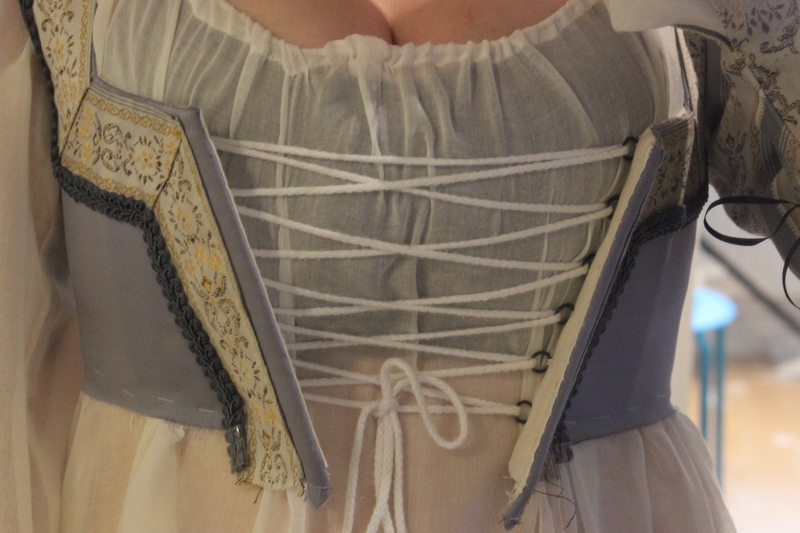 The small lacing holes I’ve made needed a thin and delicate lace – one which would not hold the preasure of my not so small bust. 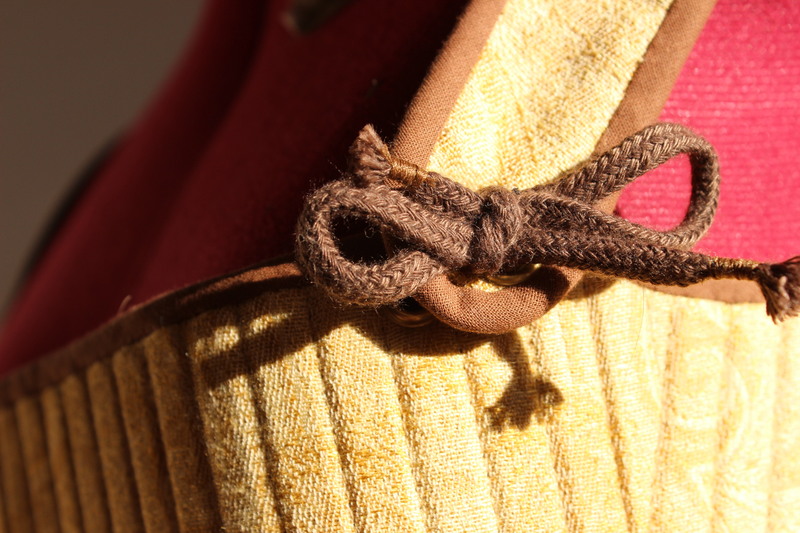 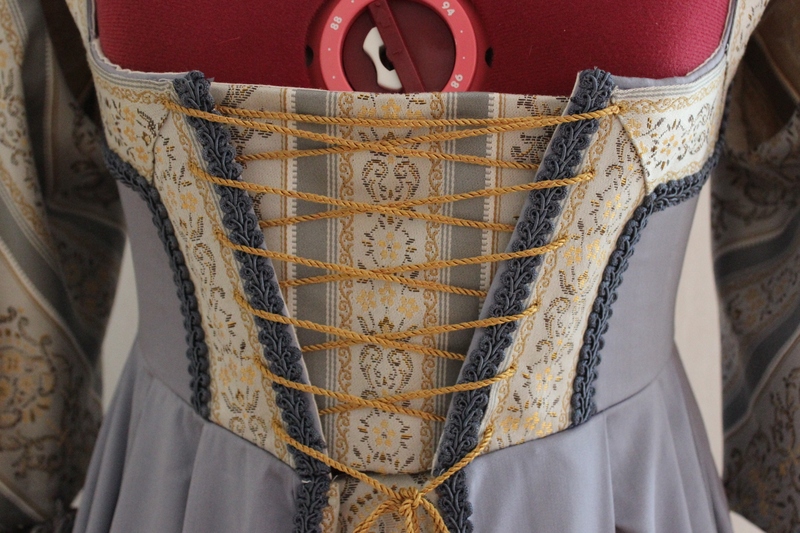 So I added some lacing rings and a cotton cord (to be hidden beneath the stomacher) to take the stress of the pretty golden laces. 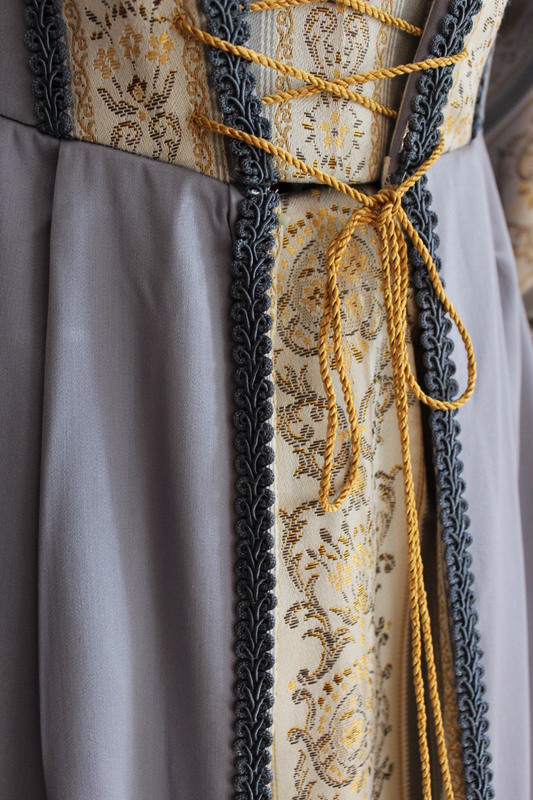 Then I added the lining to the bodice, fixed the front clouser, finished the edges of all the little laces (sooo many laces and lacing holes) and hemmed the skirt. 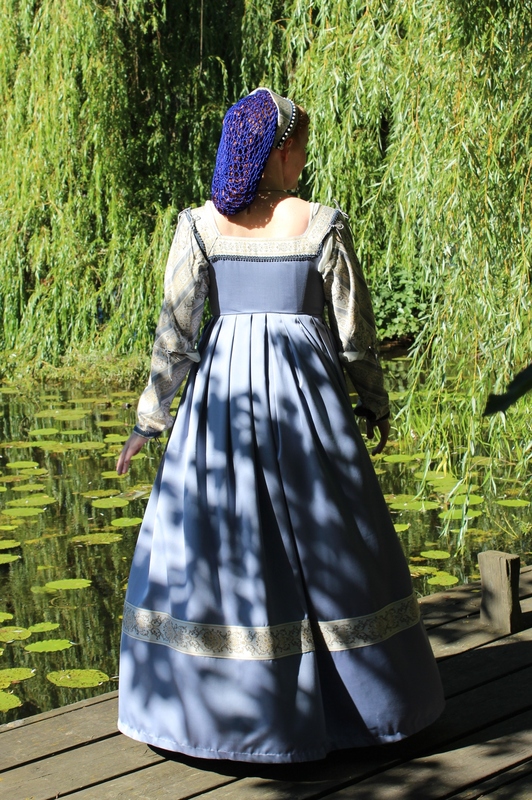 Challenge: nr 1/2016 Procrastination – I’ve been wanted to make this dress for long time, but only now (summer 2016) got around to make it. 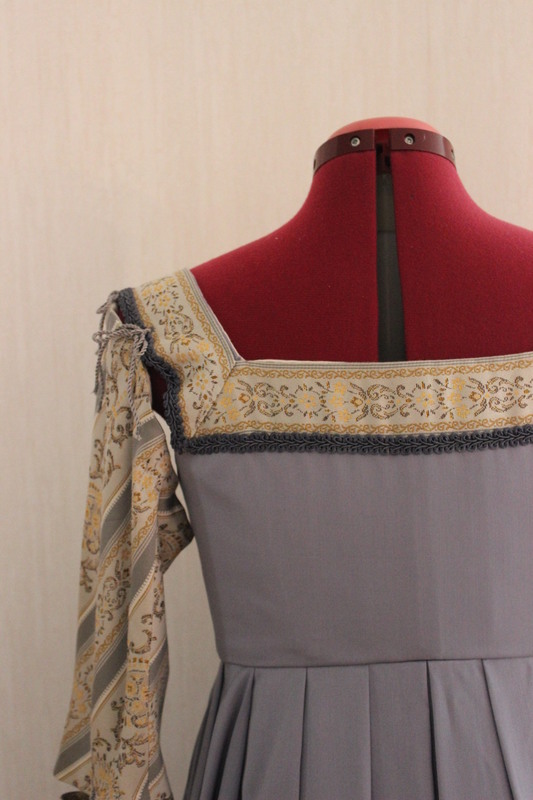 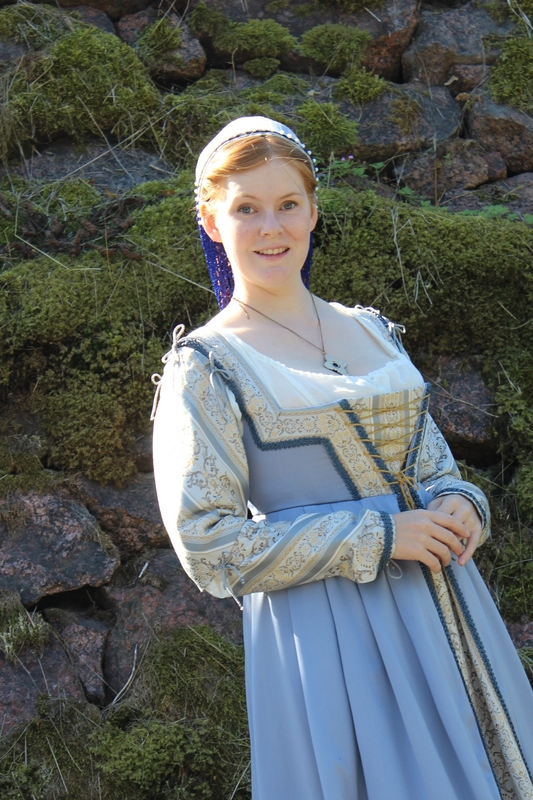 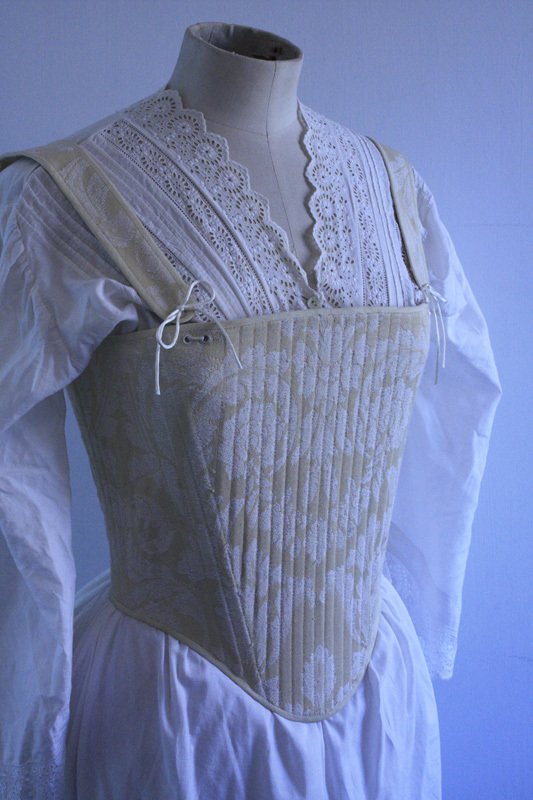 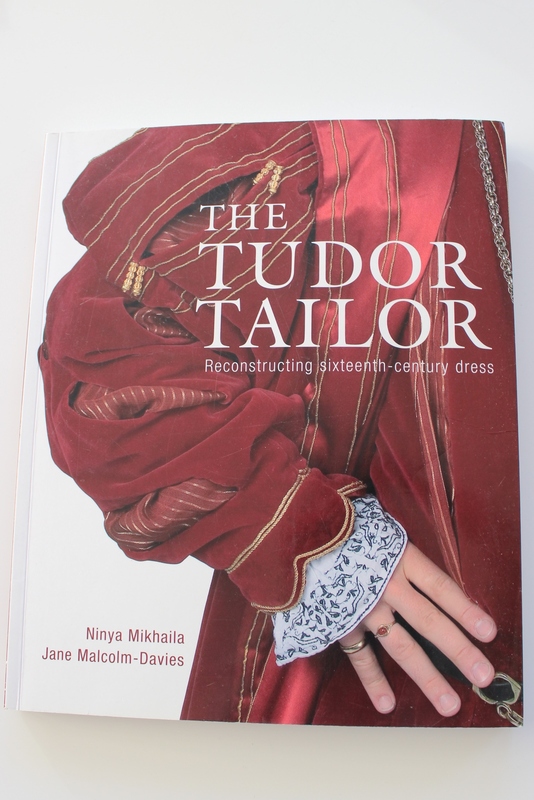 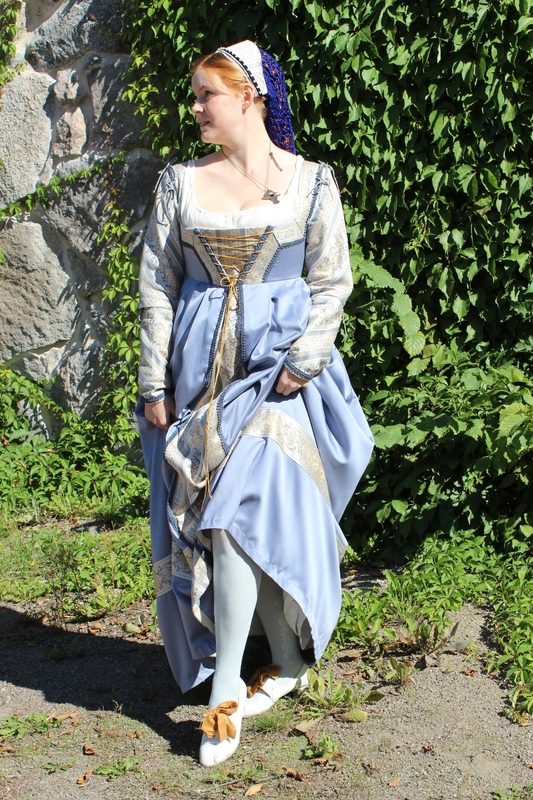 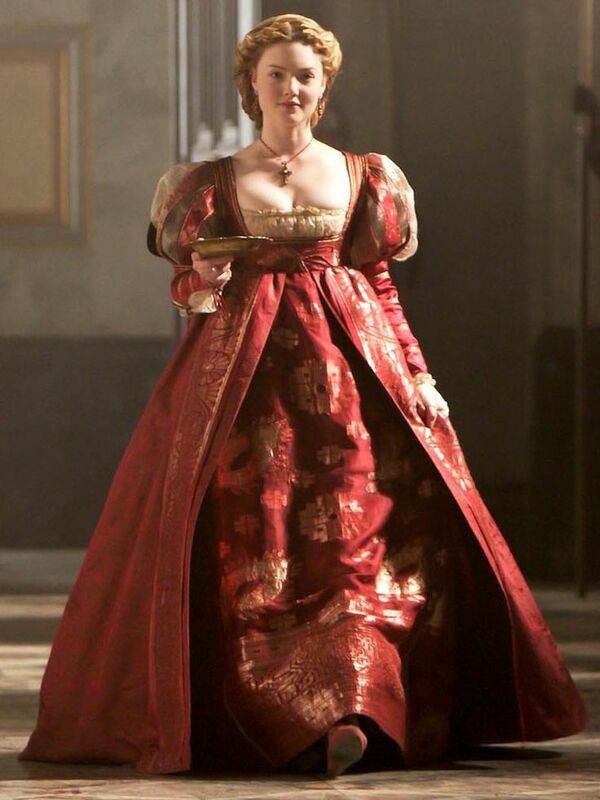 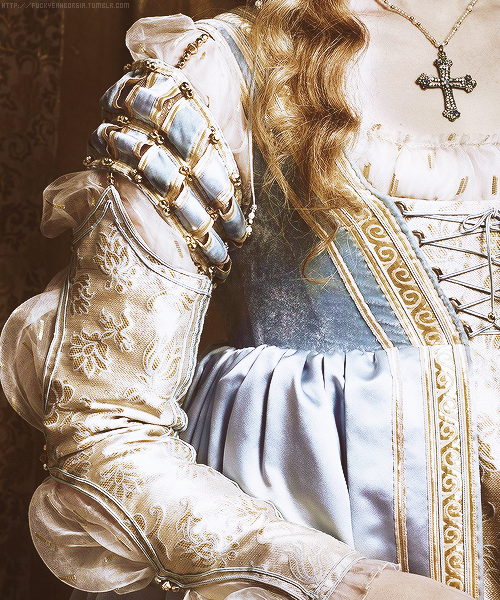 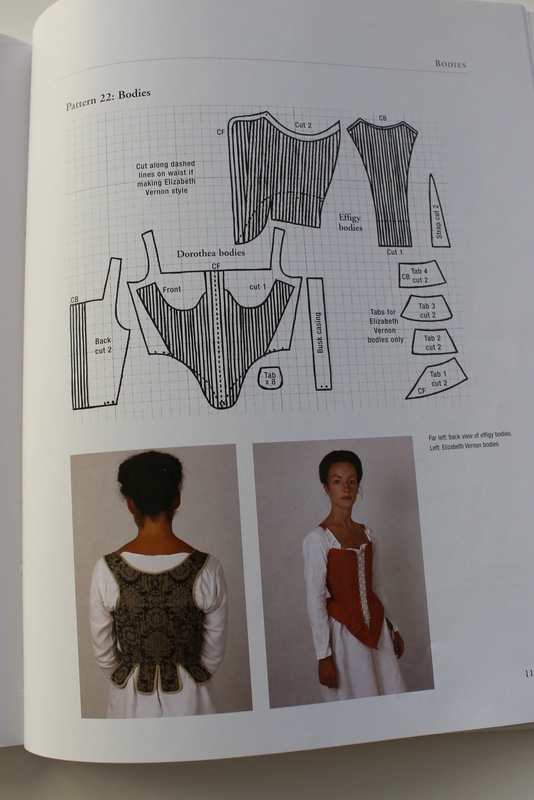 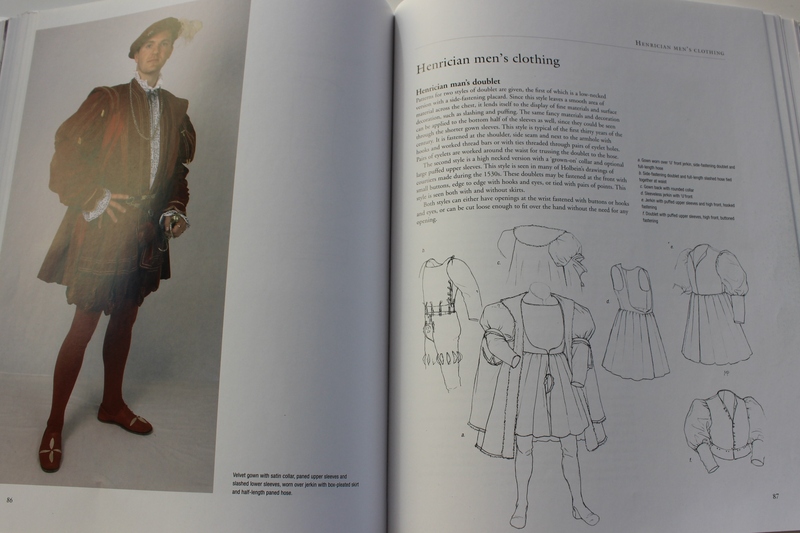 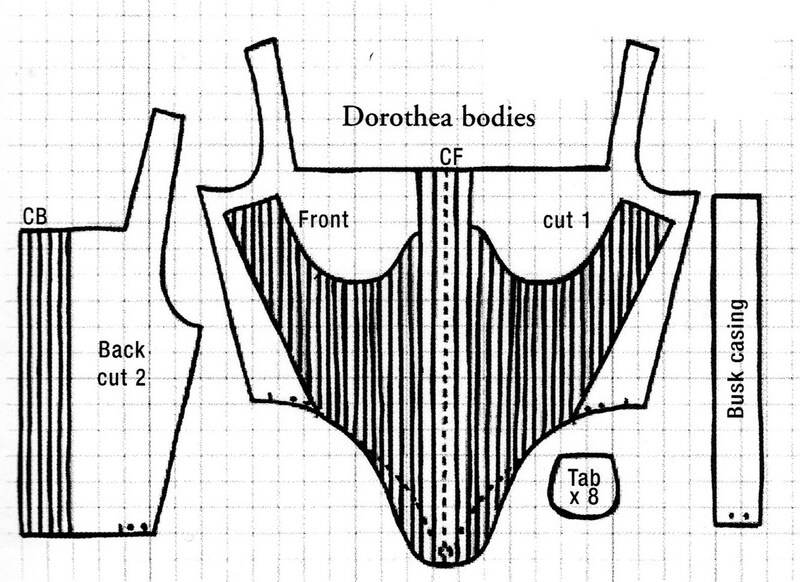 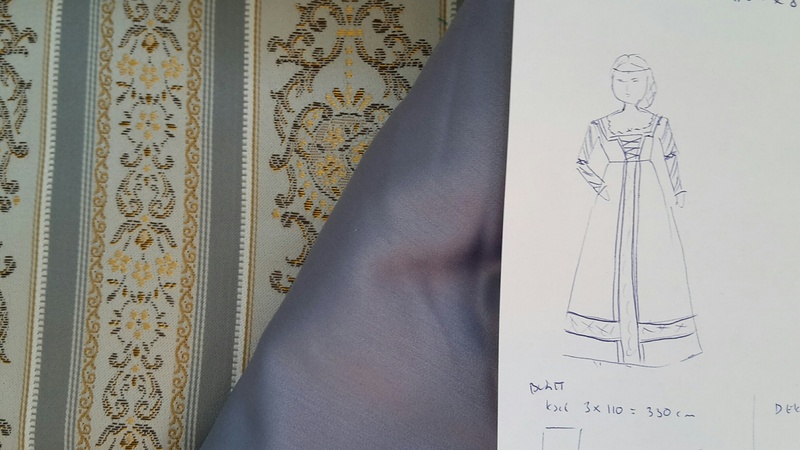 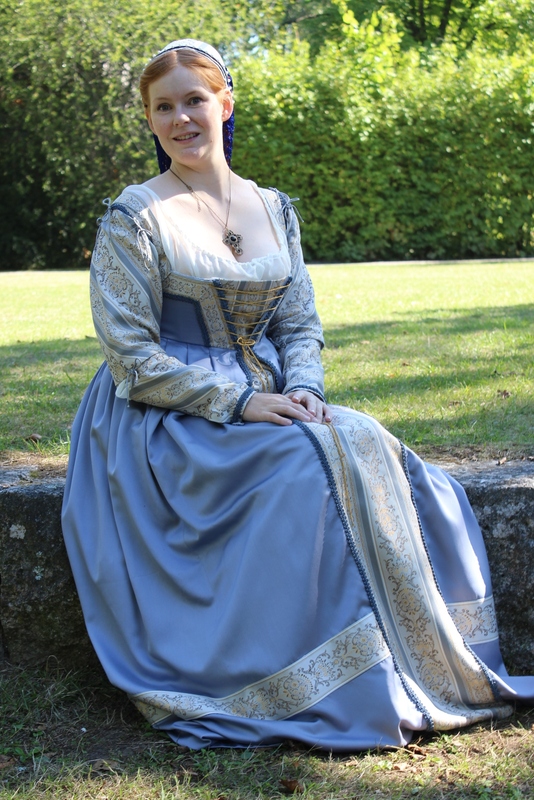 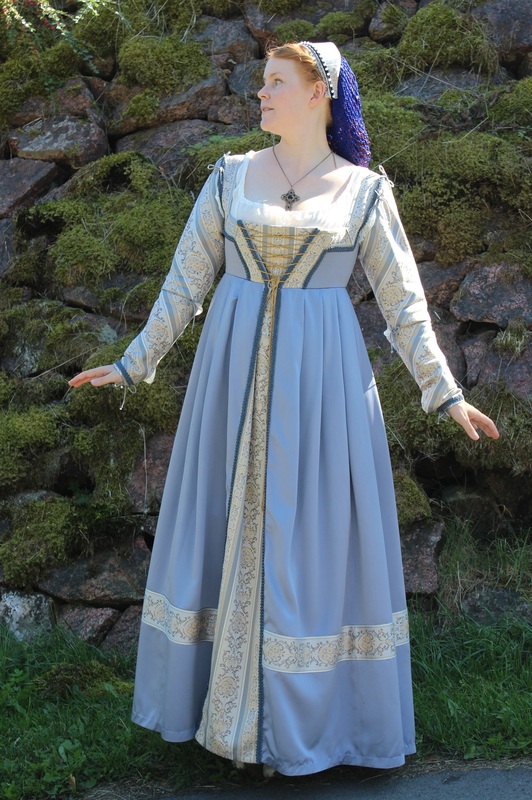 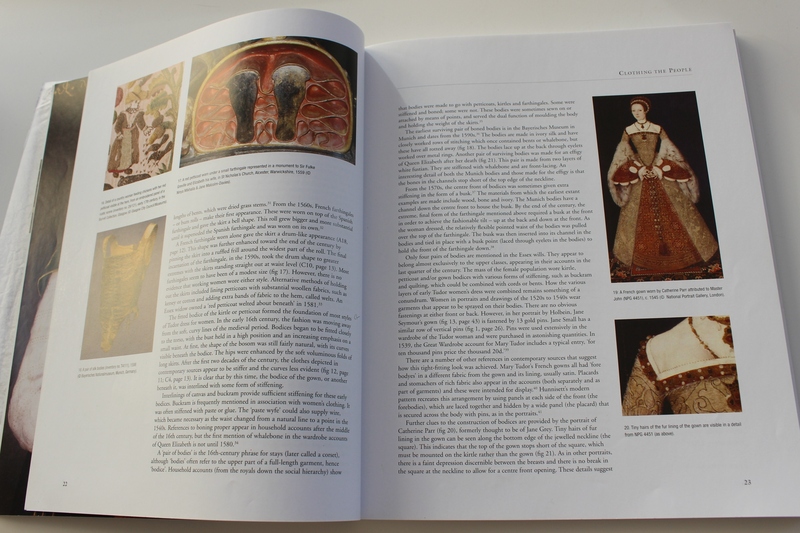 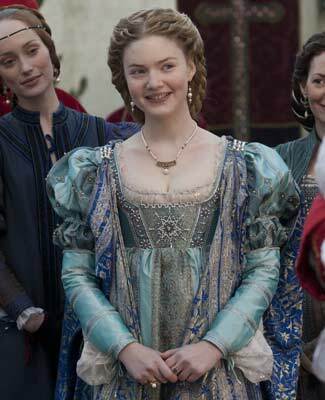 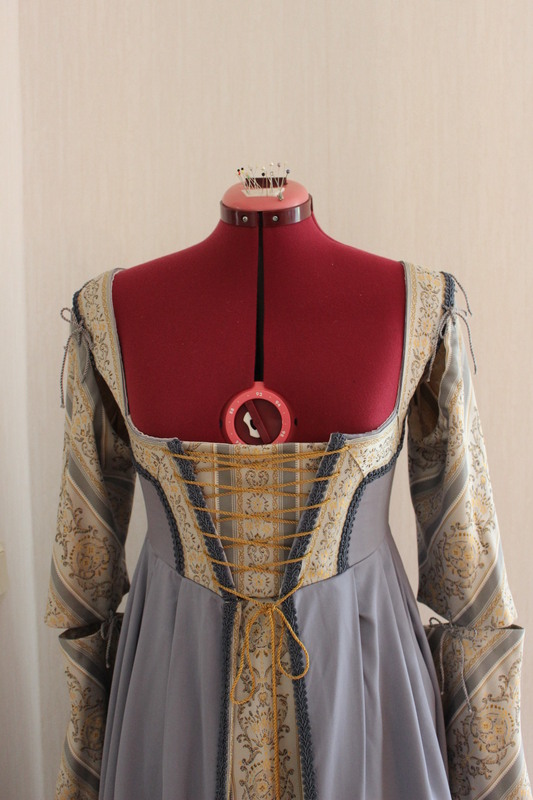 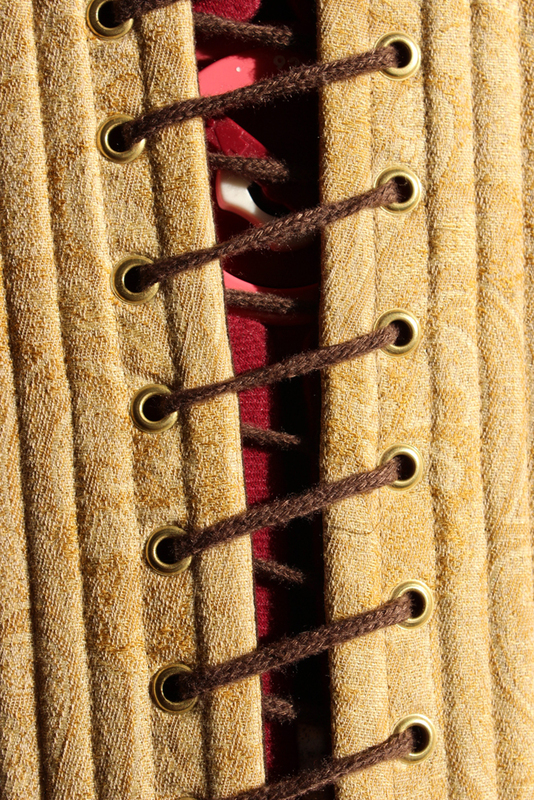 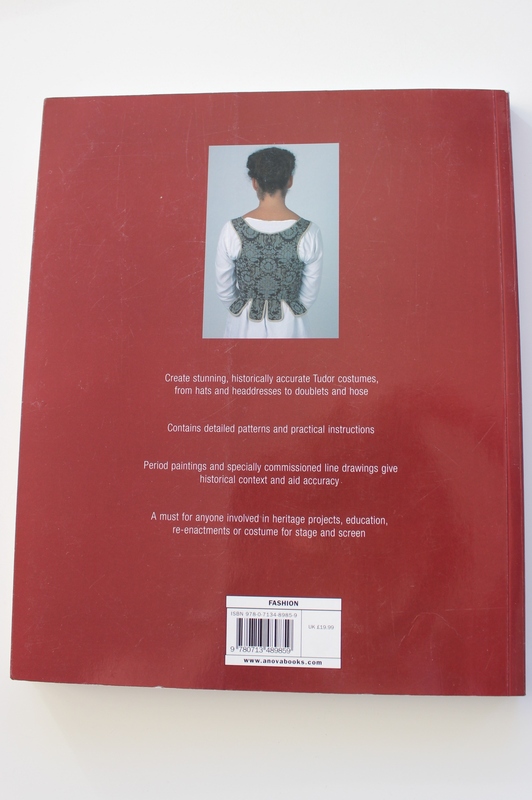 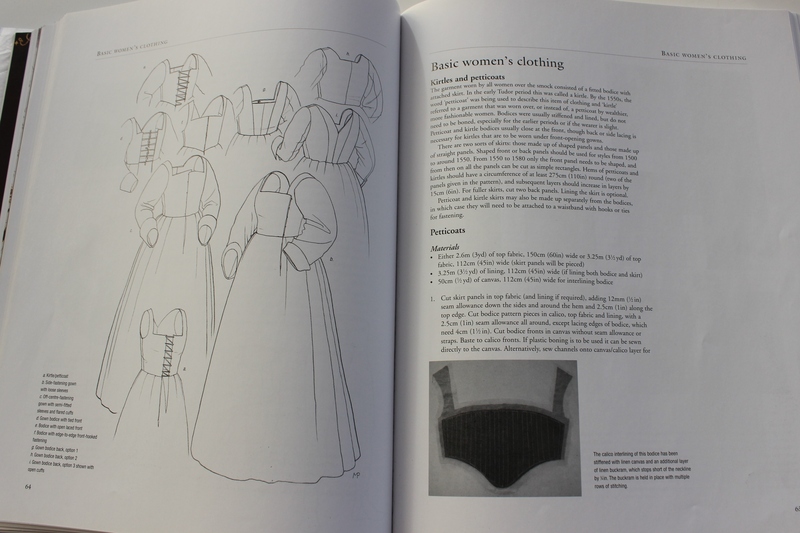 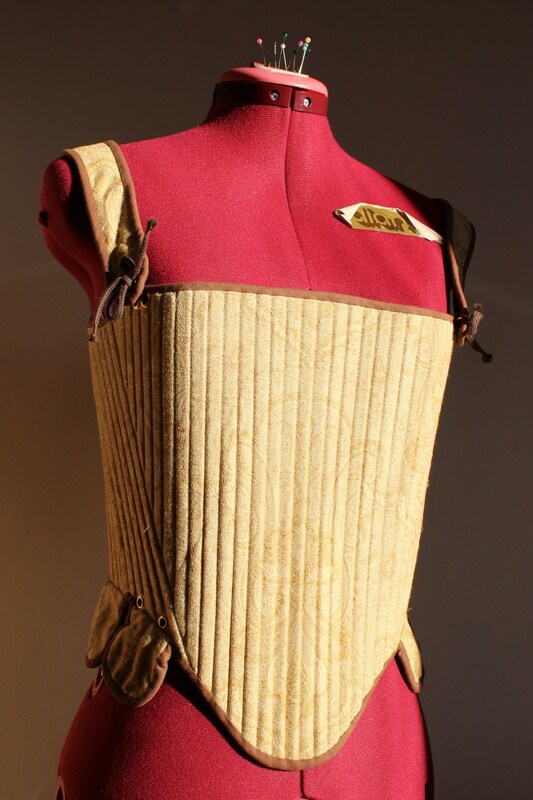 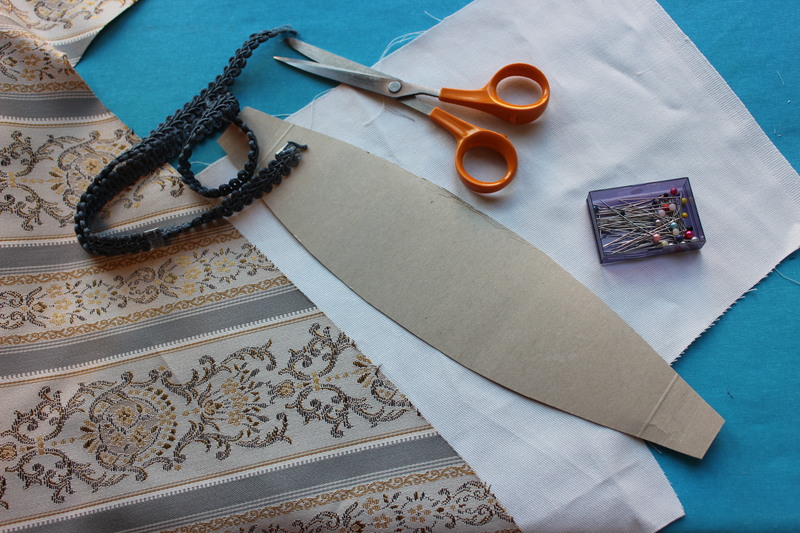 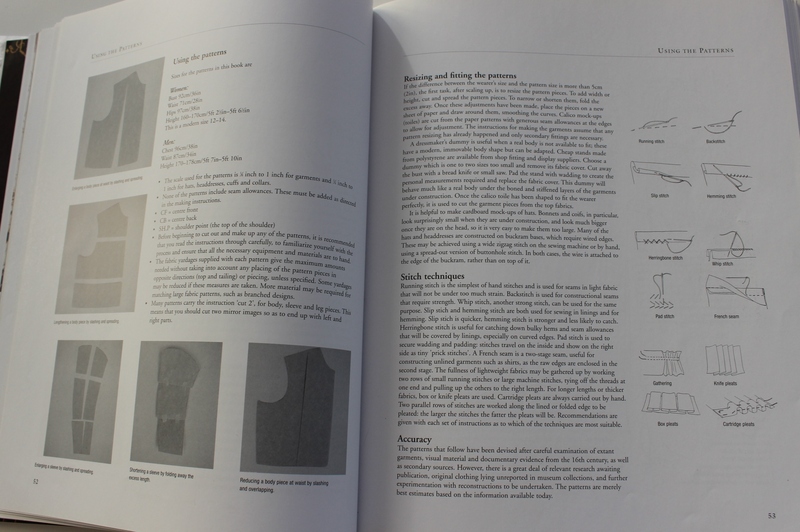 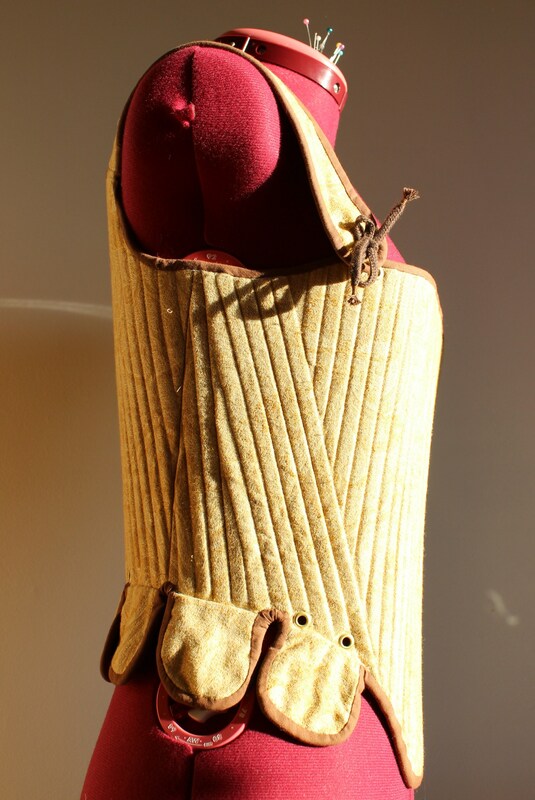 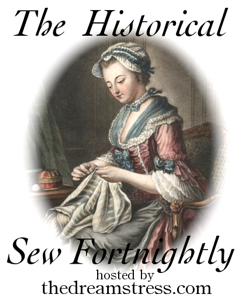 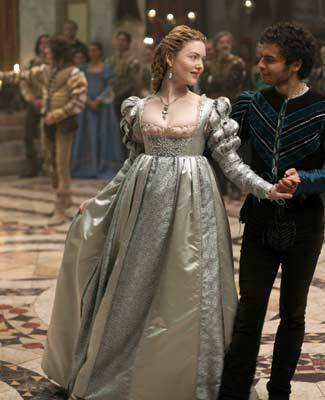 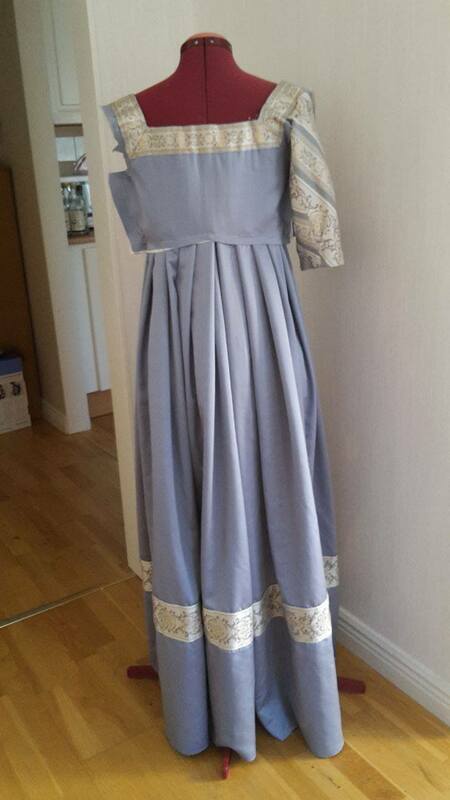 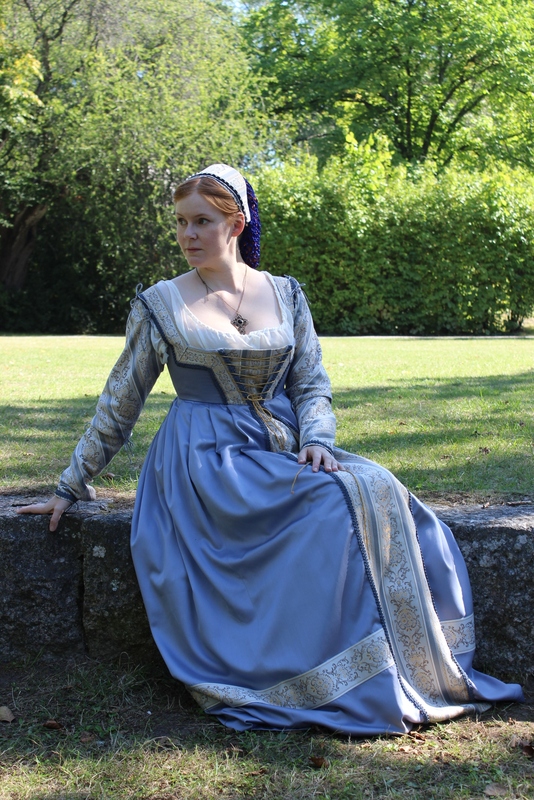 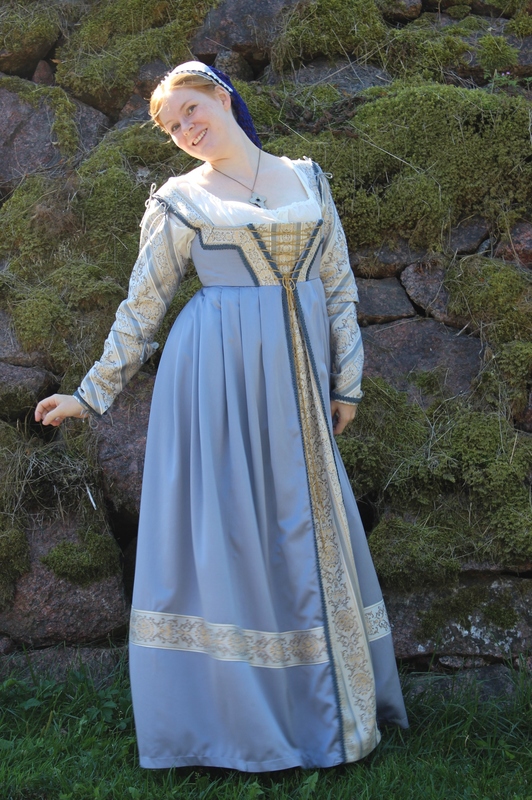 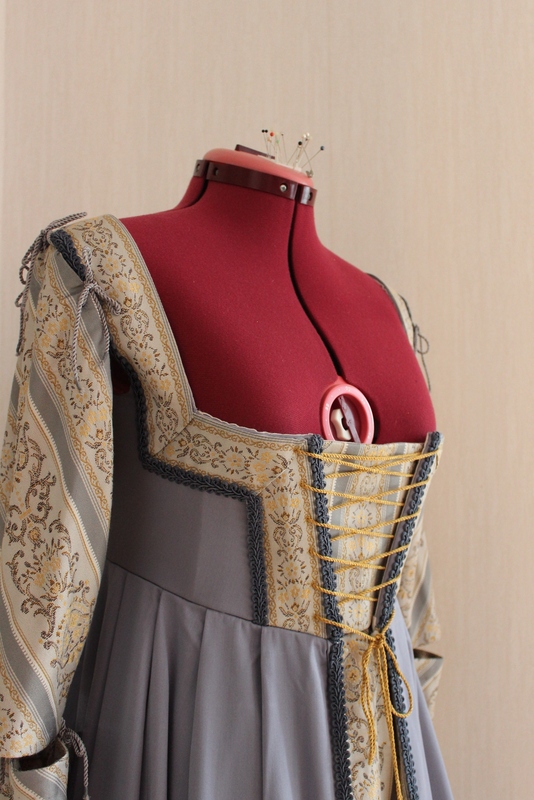 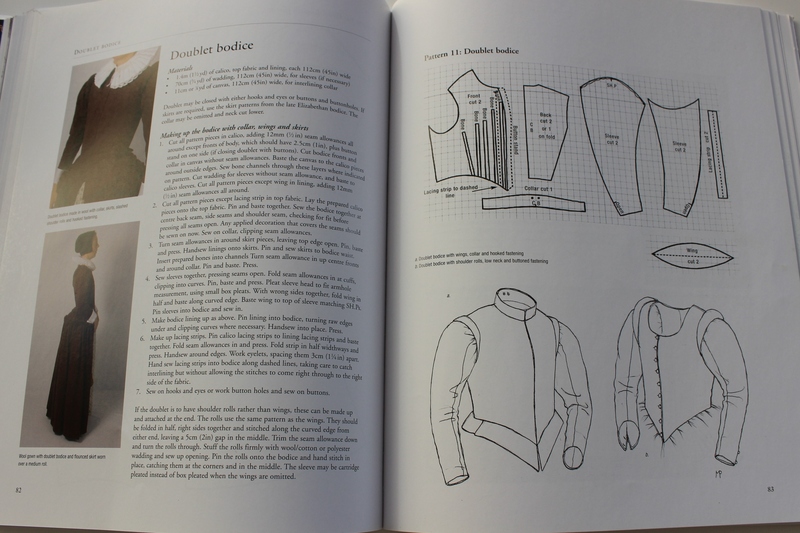 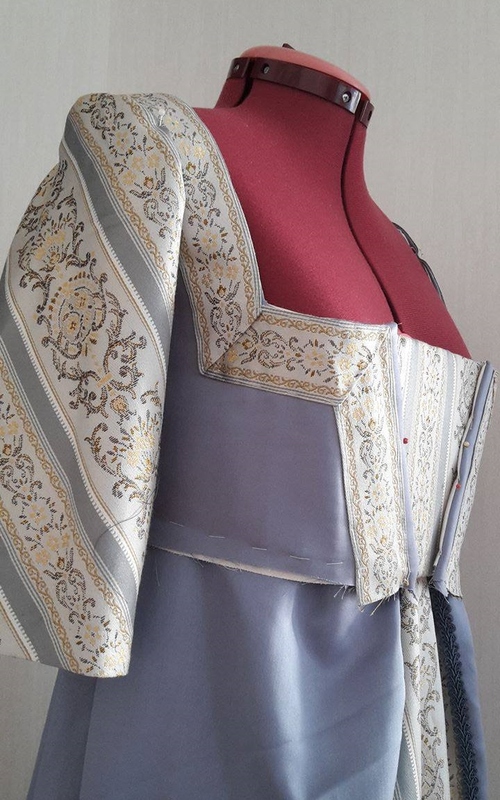 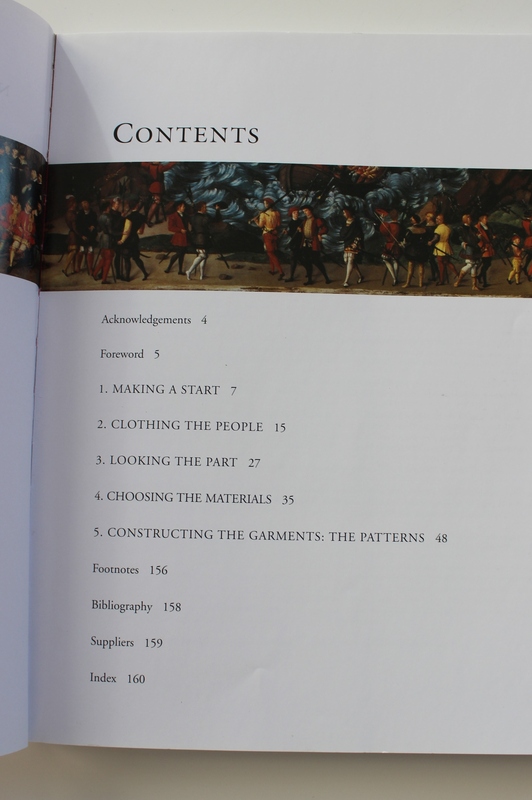 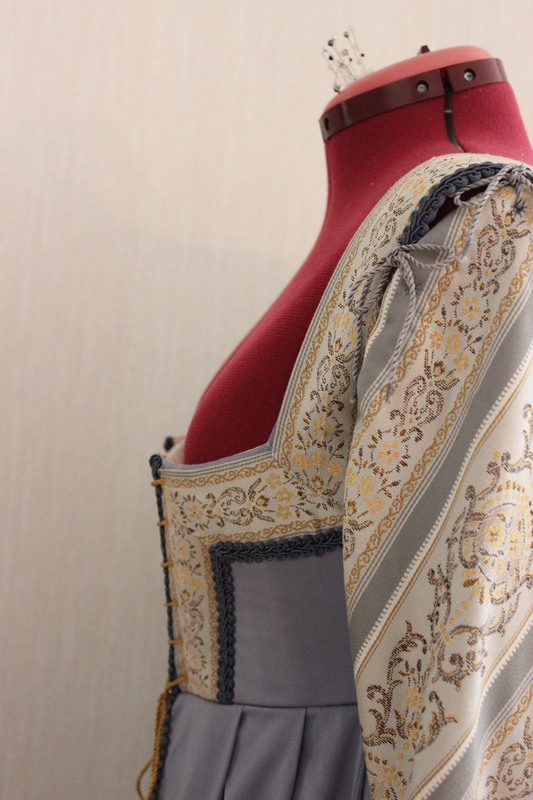 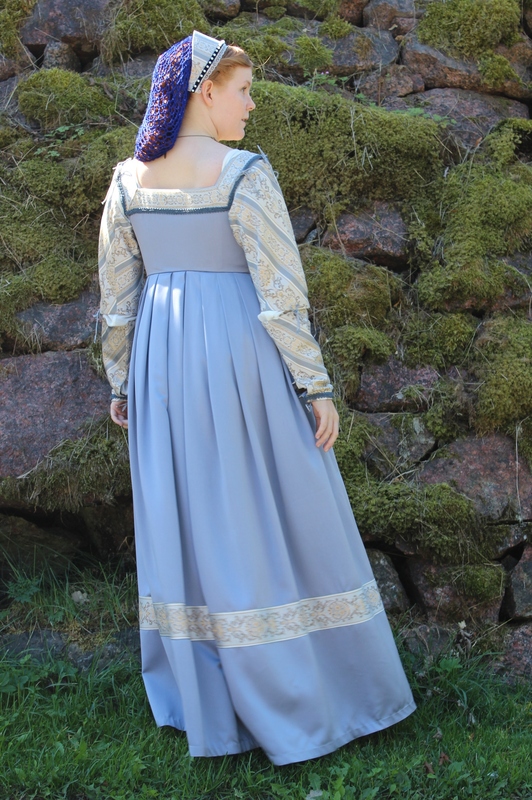 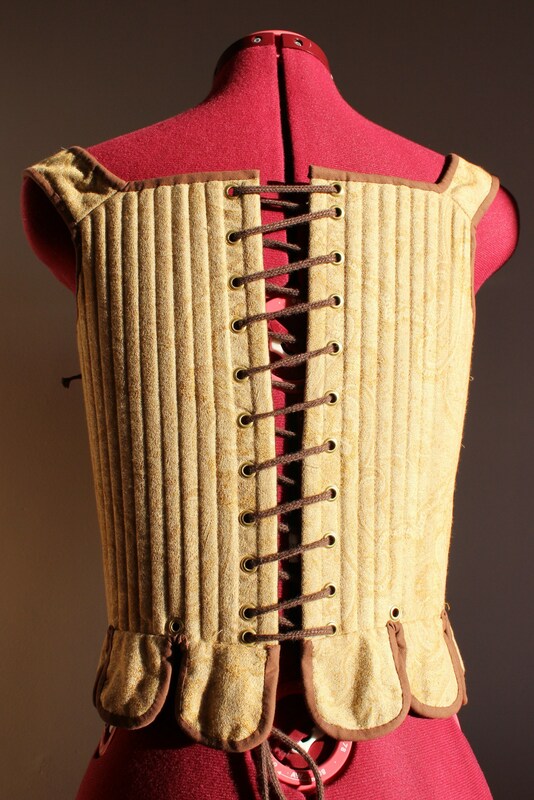 Pattern: I drafted my own, using “The tudor tailor” for reference on the bodice. 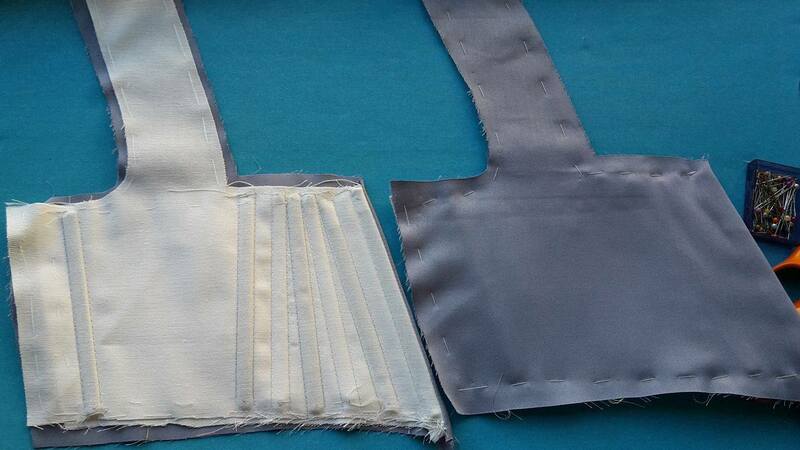 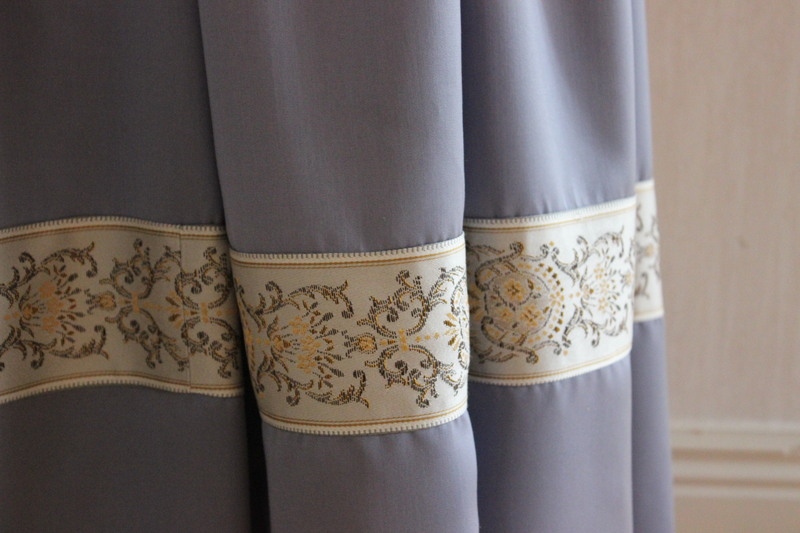 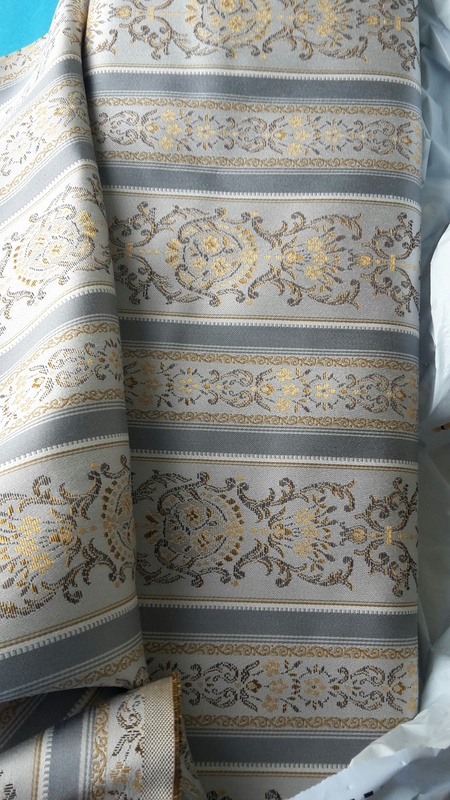 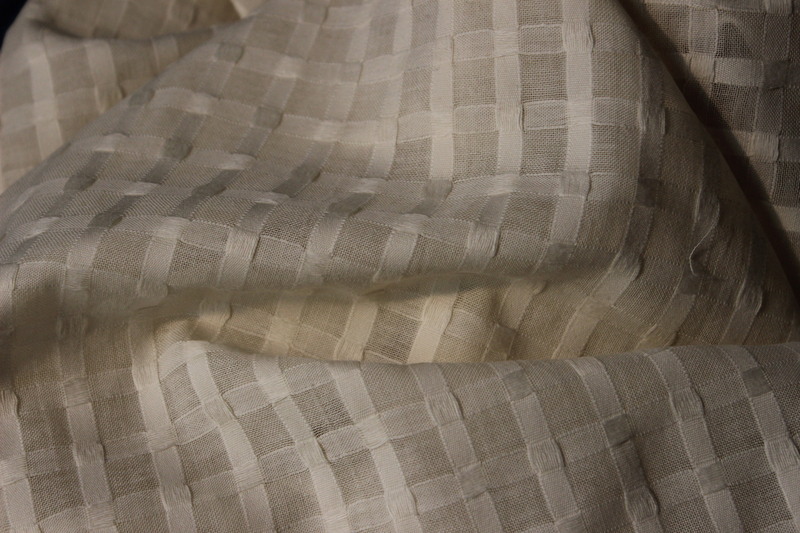 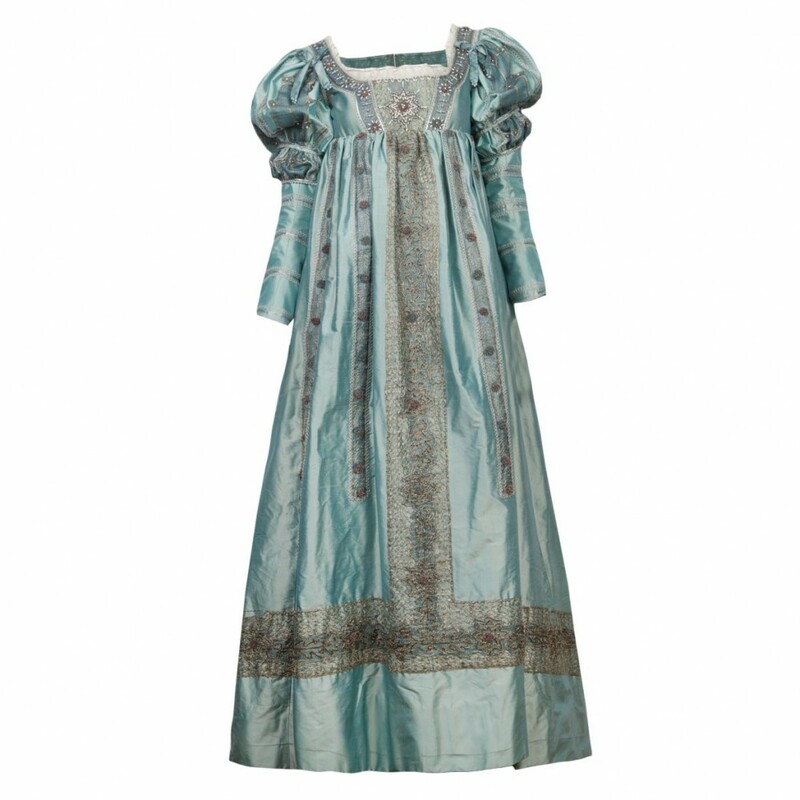 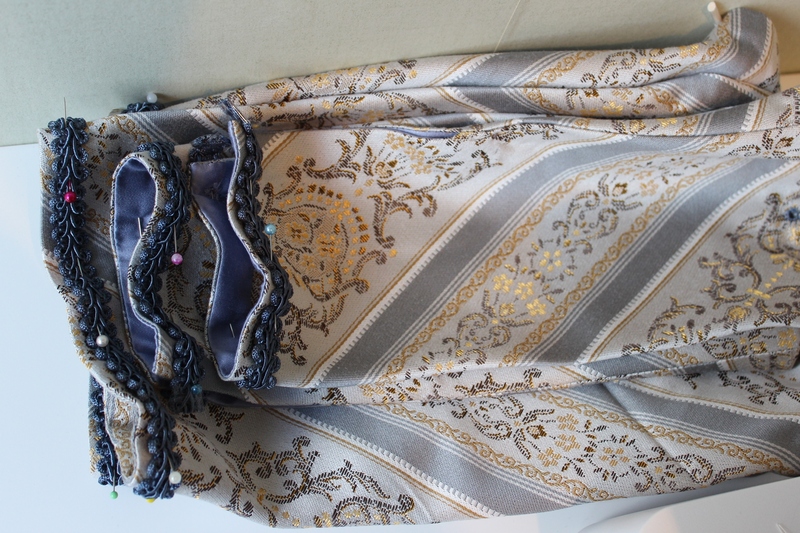 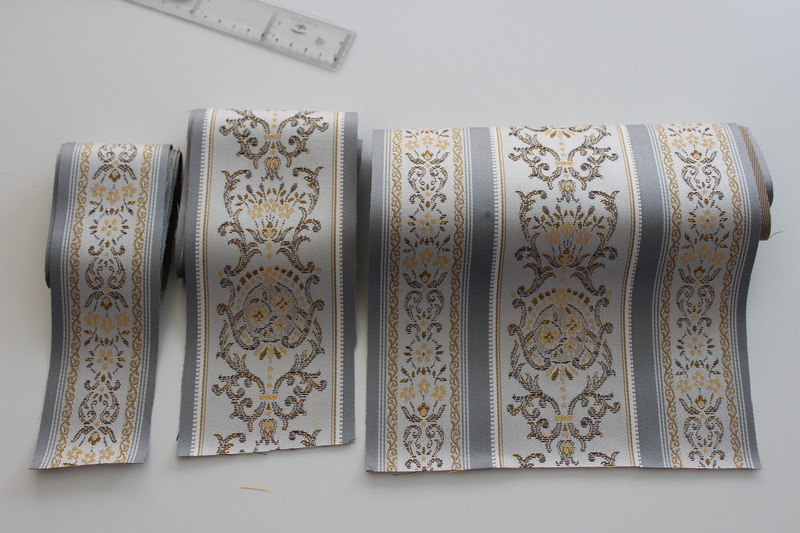 Fabric: 4 m light blue satin (1 m wide) 1,5 m striped brocade, 0,5 m white cotton for lining and interlining. 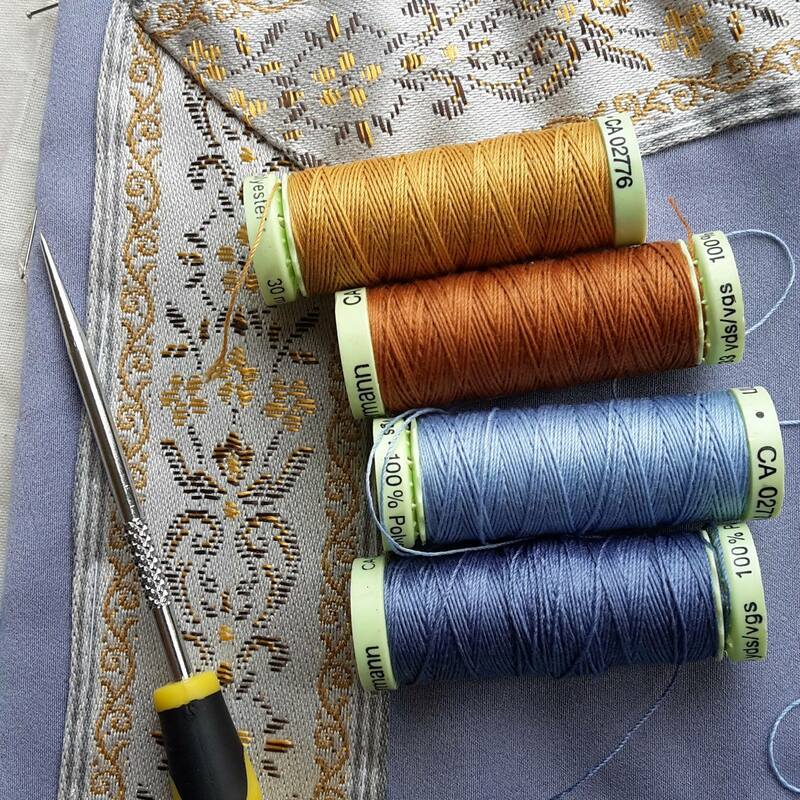 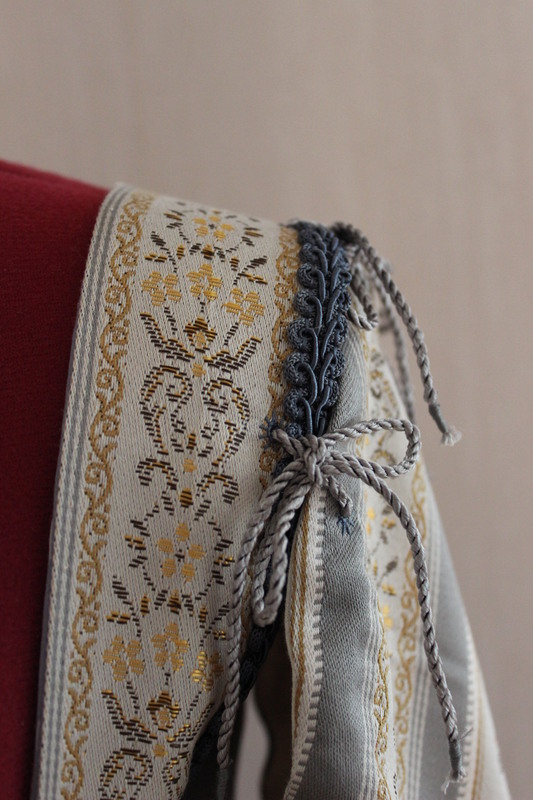 Notions: Thread, buttonhole thread, 6 m silvery ribbon, 3 m golden ribbon for front lacing, 3 m cotton lacing for internal lacing, 12 lacing rings, 2 m plastic boning, 0,5 m steel boning, 4 m blue furniture braid for decoration. 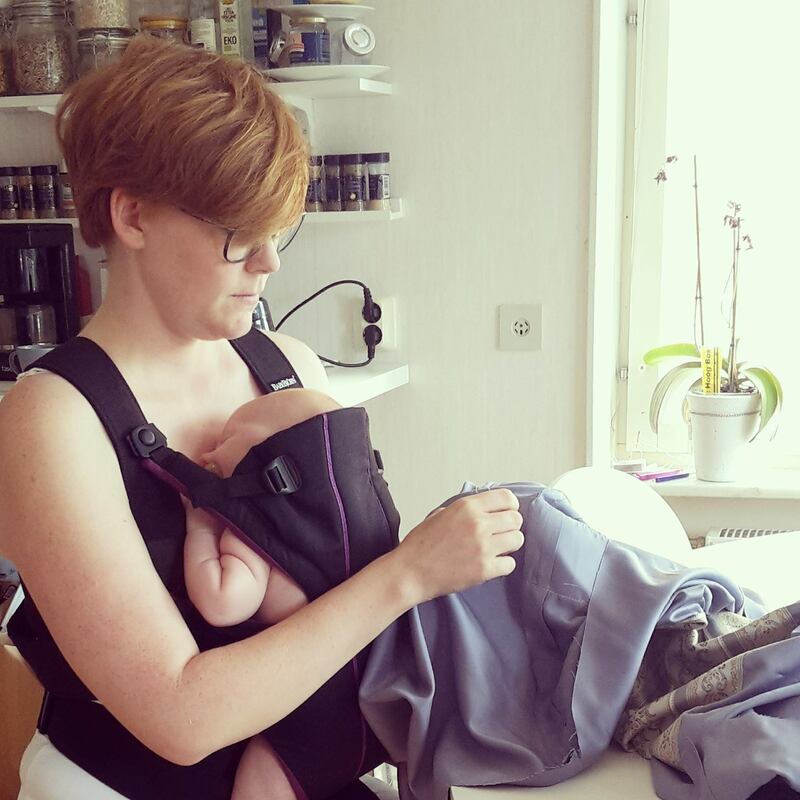 Time: Way to long – I would guess about 20 hours over the course of 1,5 month, working in small batches of maximum 1 hour at the time. 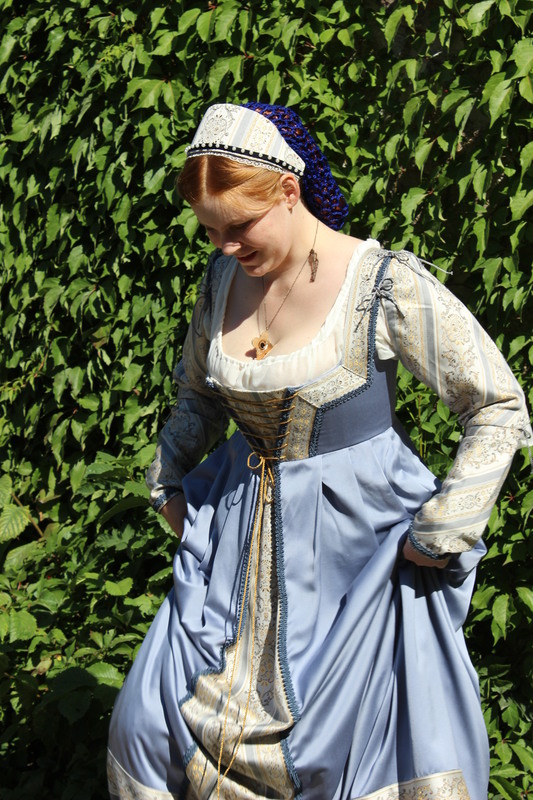 First worn: For photos mid August and at a Medieval Fair late August. 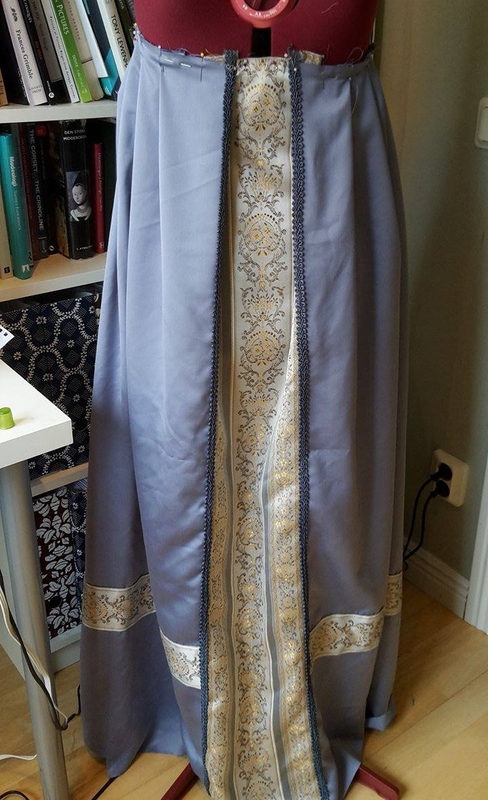 Final Thoughts: I actually like it even though I feel like Booberella in it. 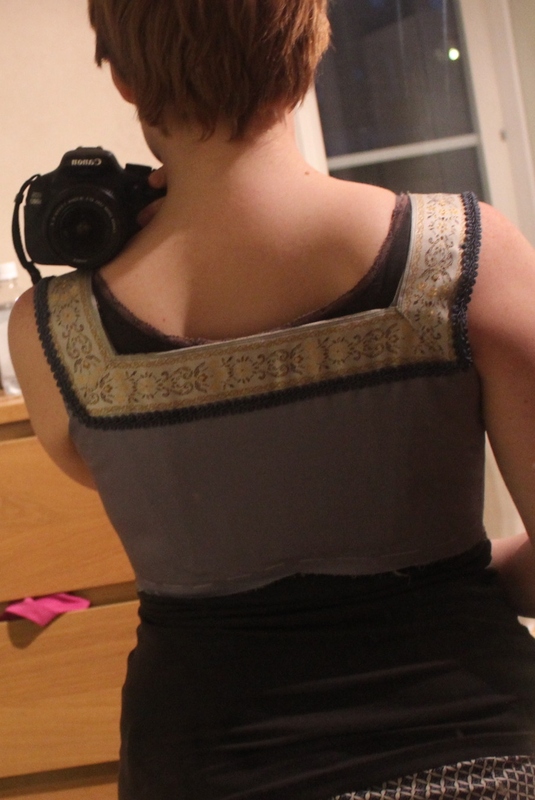 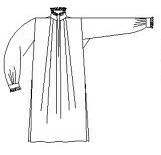 The neckline ended up to low, and the way it closes in the front are not the best solution. 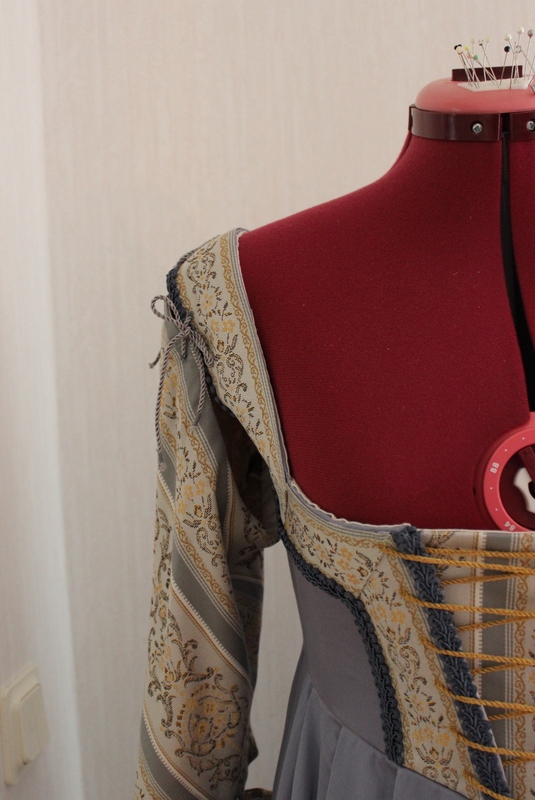 But I think this is one of the most decorated pieces I’ve ever made, and think it looks great. 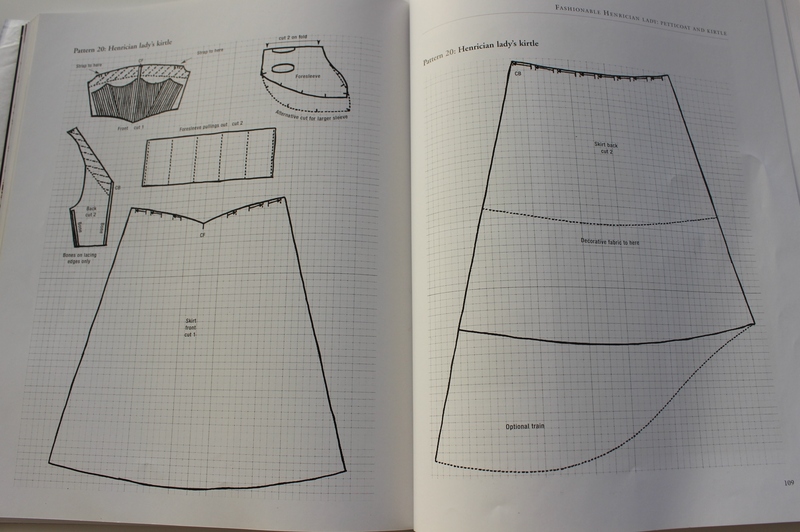 once all the pieces was cut I started working on the skirt. 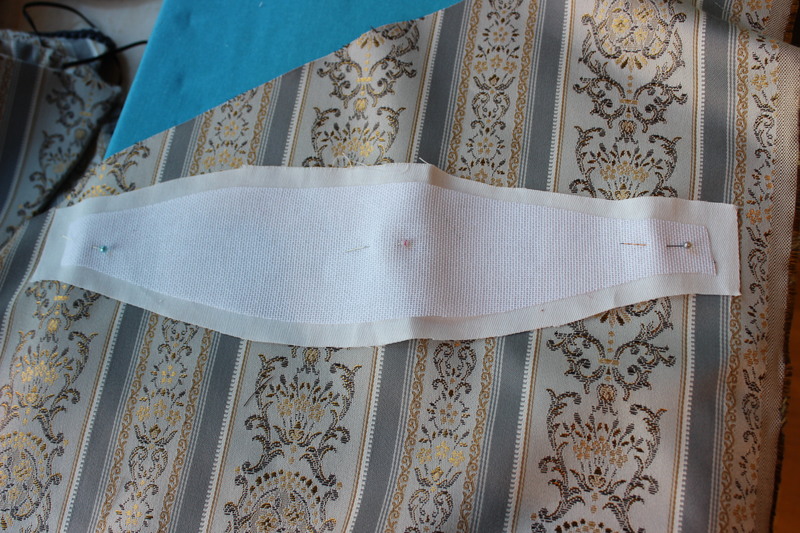 I stitched the panels together, leaving the center back open. 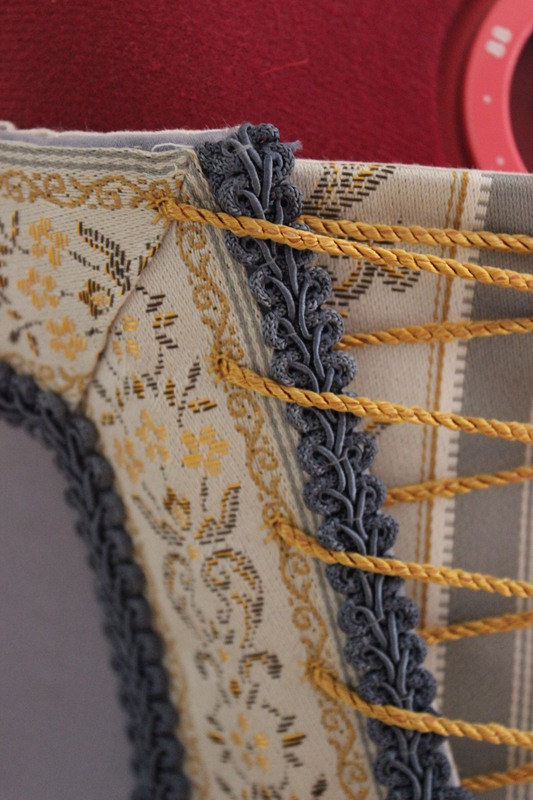 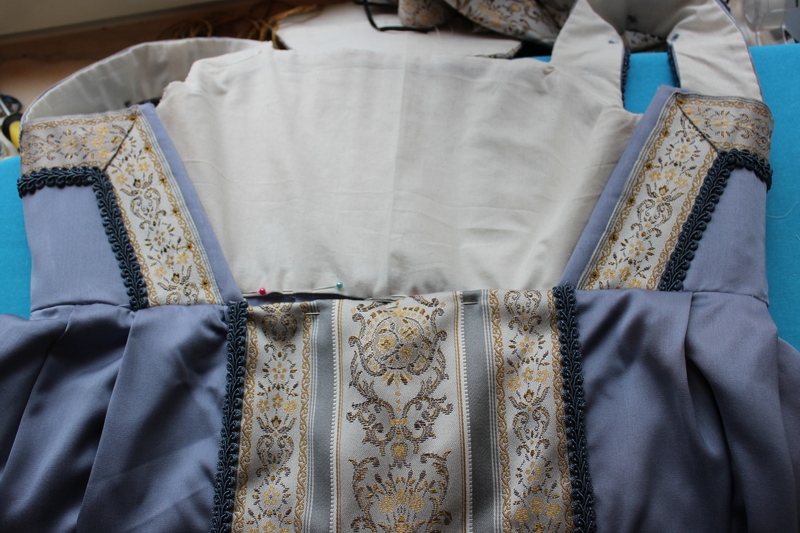 Then I pinned and basted two different kinds of brocade trim to the front and along the lower edge. 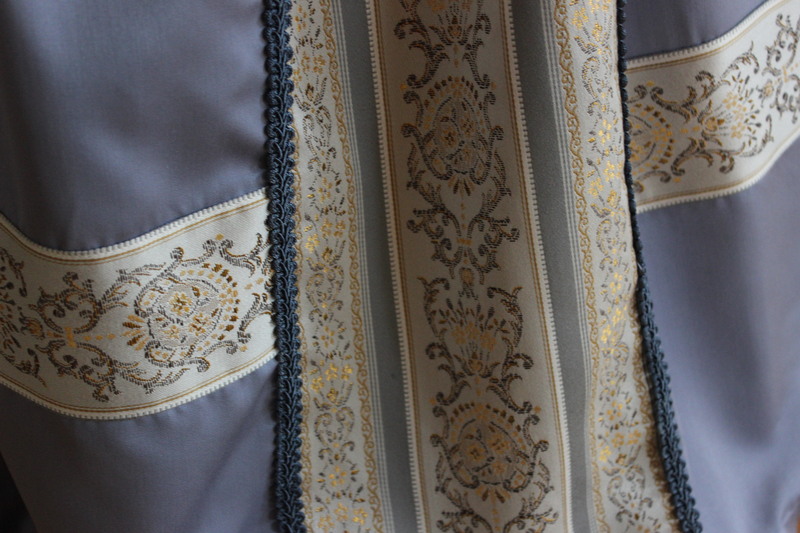 I also added some blue furniture band along the center front decoration. 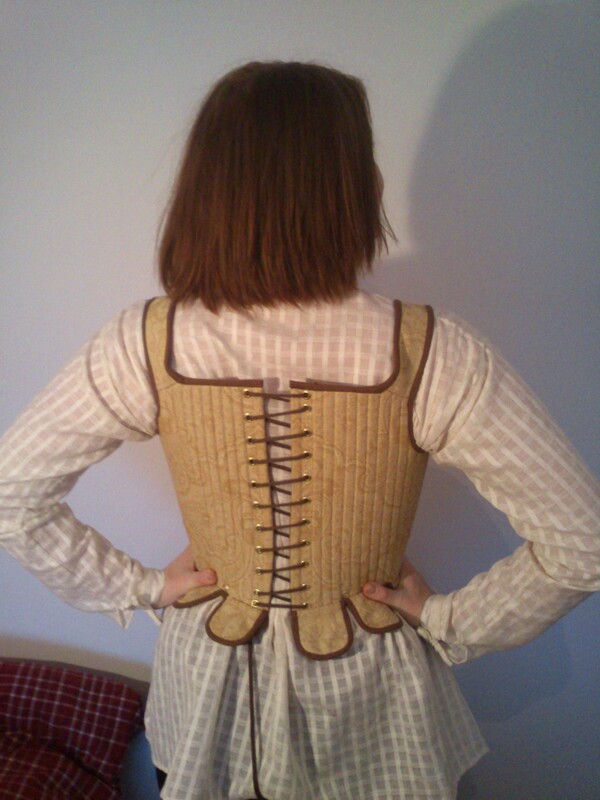 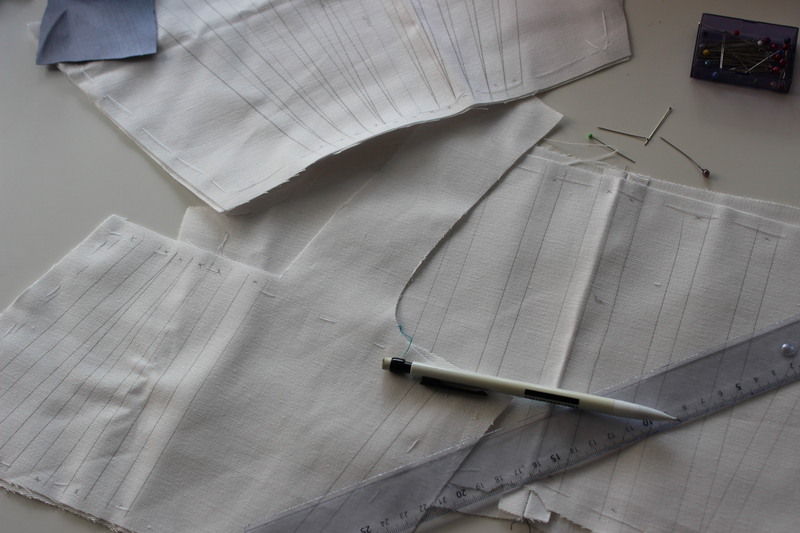 Then I stitched the back shut and pleated the waist to the right measurement. 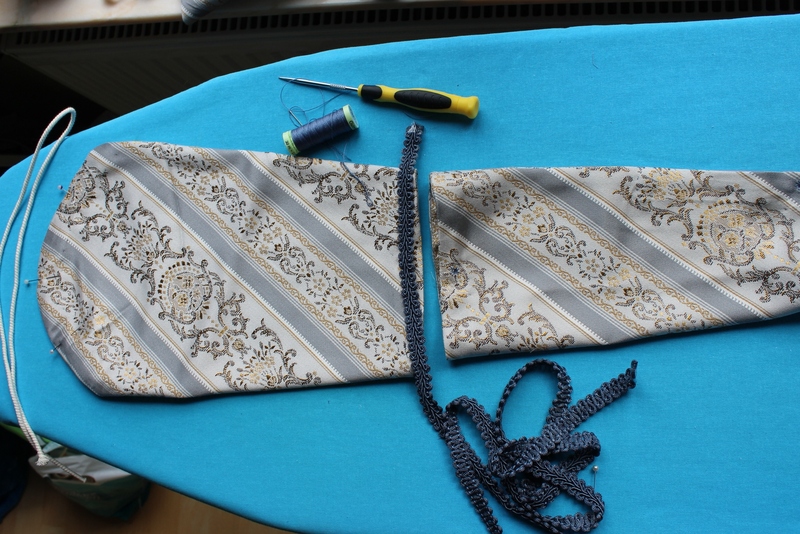 The wide stripe looked a bit strange at the top, so I folded some of it under to create an adjustable pleat. 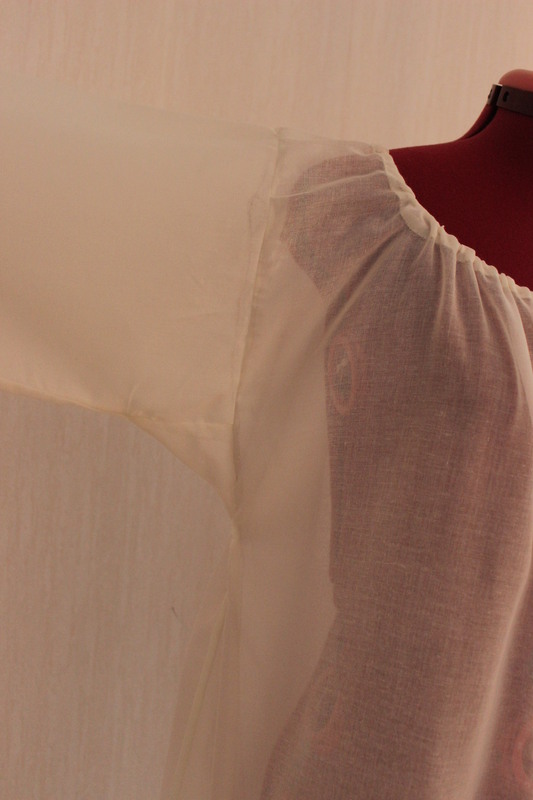 Then it was time for the sleeves. 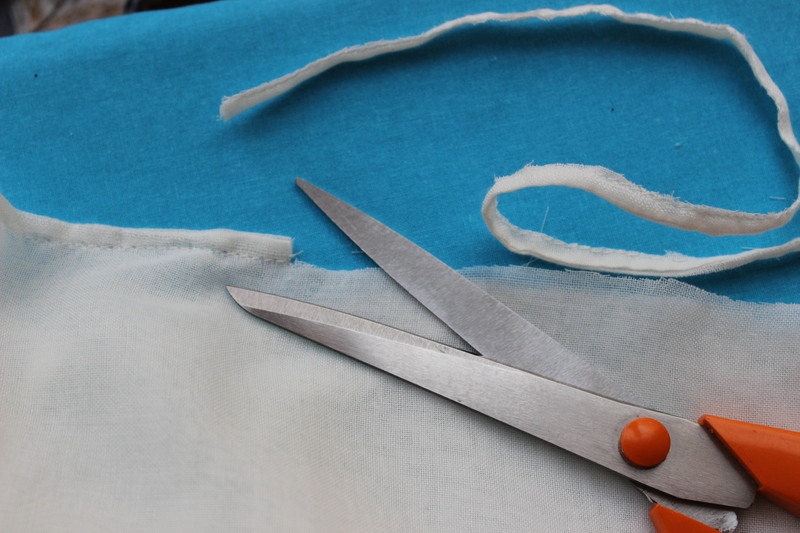 Cutting the sleeves on the bias. 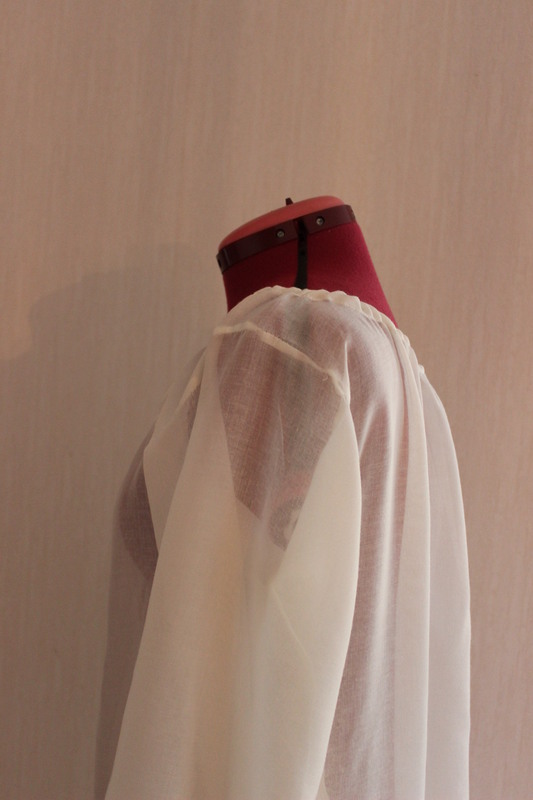 After some hesitation I decided to cut the sleeves into two pieces each and to make them tied on, like the ones in my inspiration. 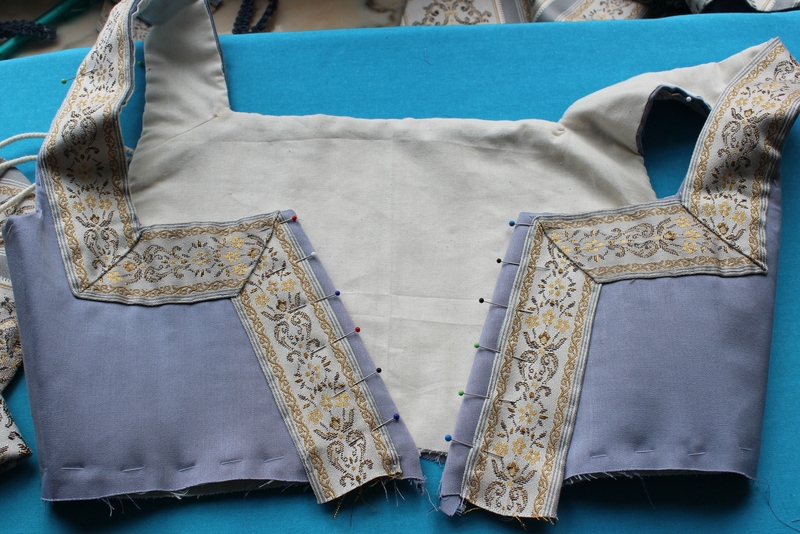 experimenting with trim All the pieces of the sleeves ready for decoration. 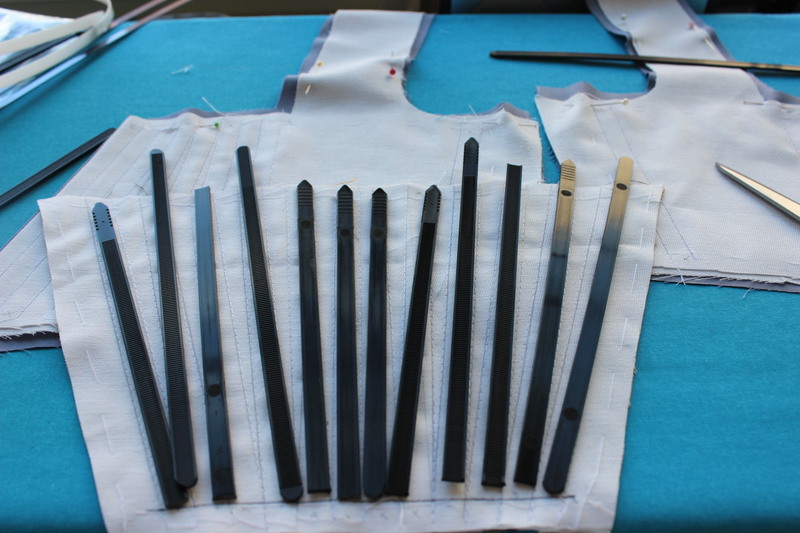 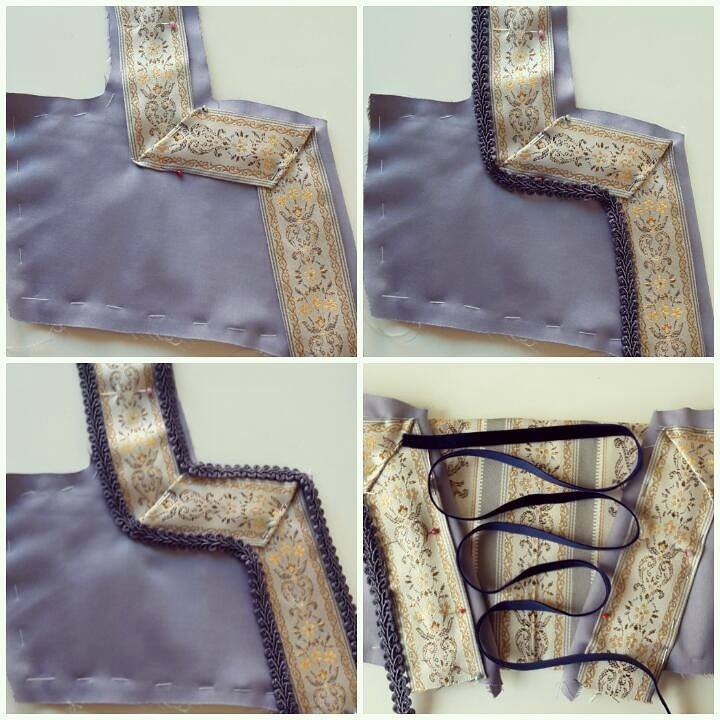 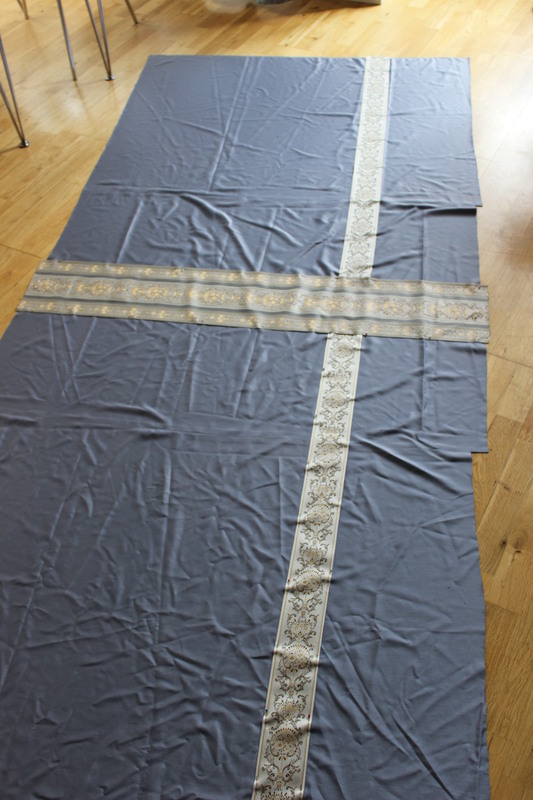 I cut the pieces in blue satin with un-bleached cotton for lining and interlining which I basted to the satin after drawing on the boning channels. 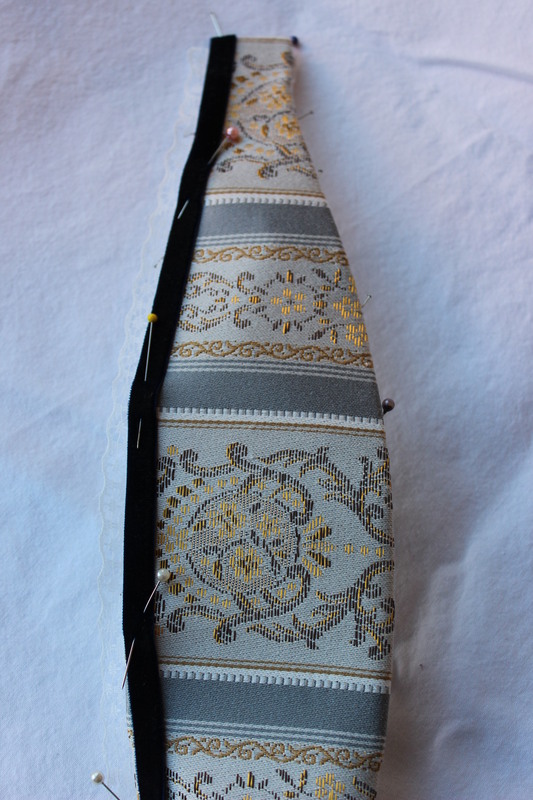 Before stitching it together I needed to figure out and ad the decoration. 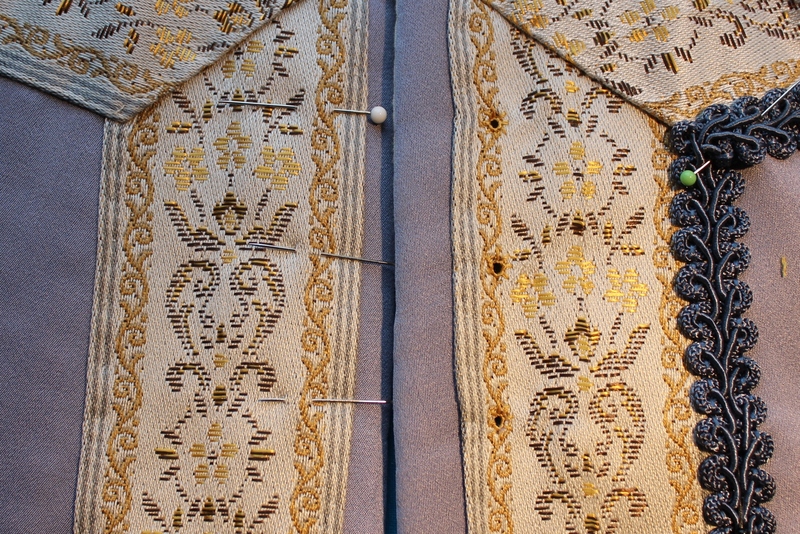 One line of brocade pinned on. 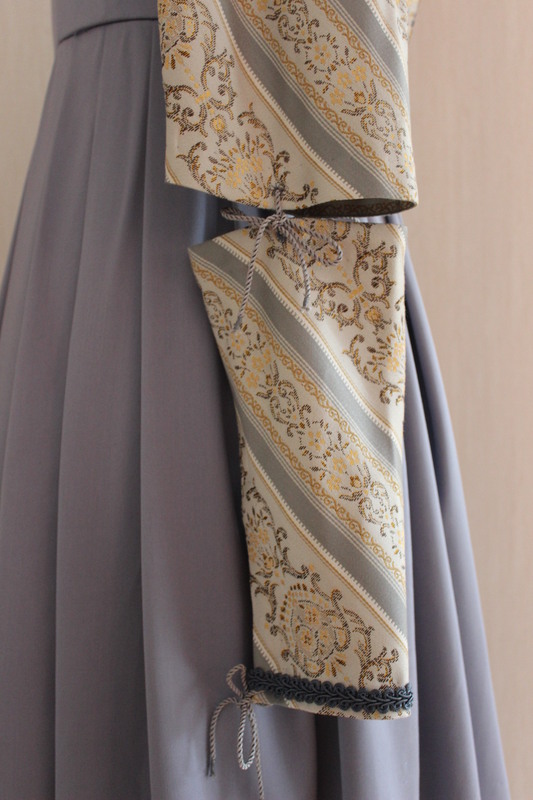 It was around this point I put it on the dressform to get a grip on the over all look. 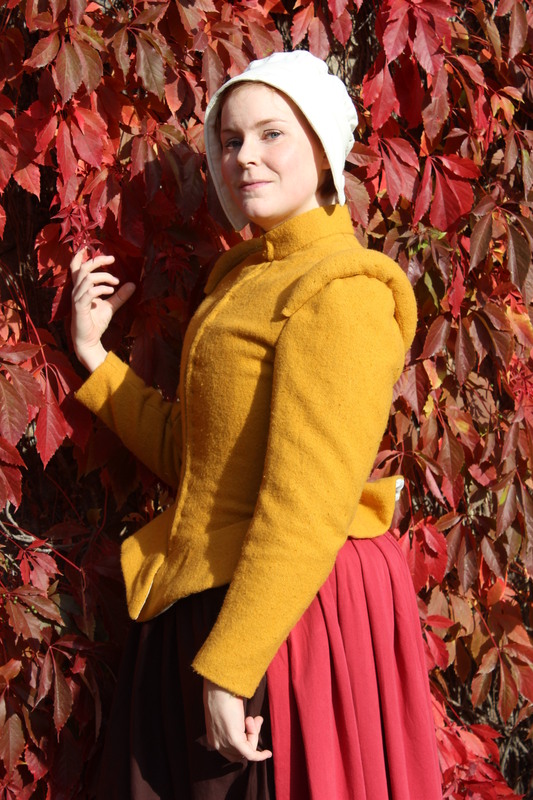 Yesterday I talked my sister into helping me with yet another photoshoot. 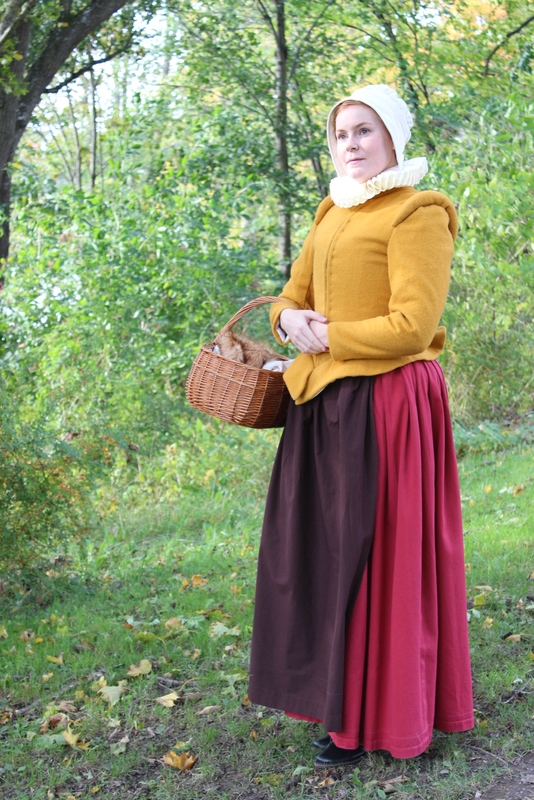 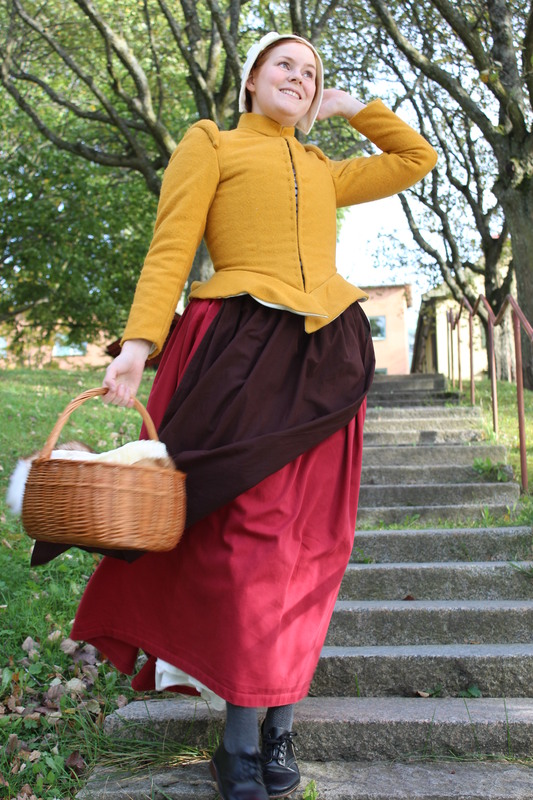 It was really windy outside, and I constantly needed to re-arrange my apron and bonnet. 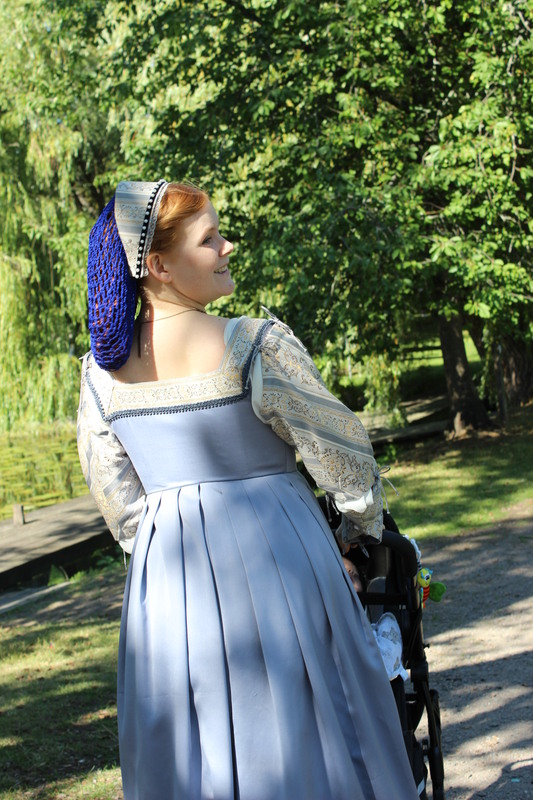 But I think we got some nice shoots anyway. 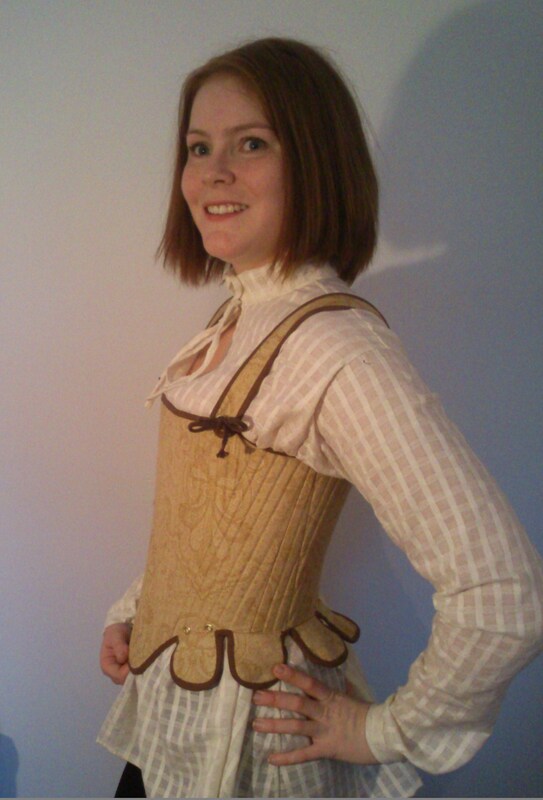 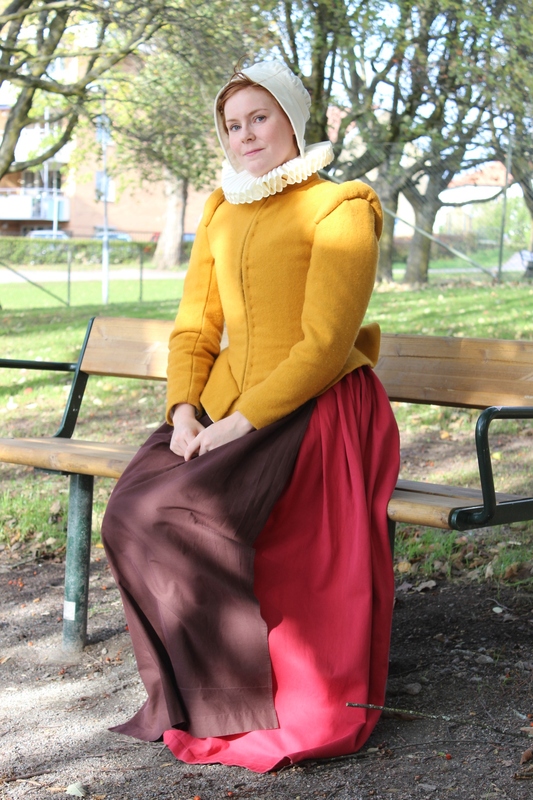 And yes, the doublet are a bit to smal for me, and I really need to press the pleats on the peplum down.